Spring is finally here and this kitchen feature is truly a breath of fresh air! 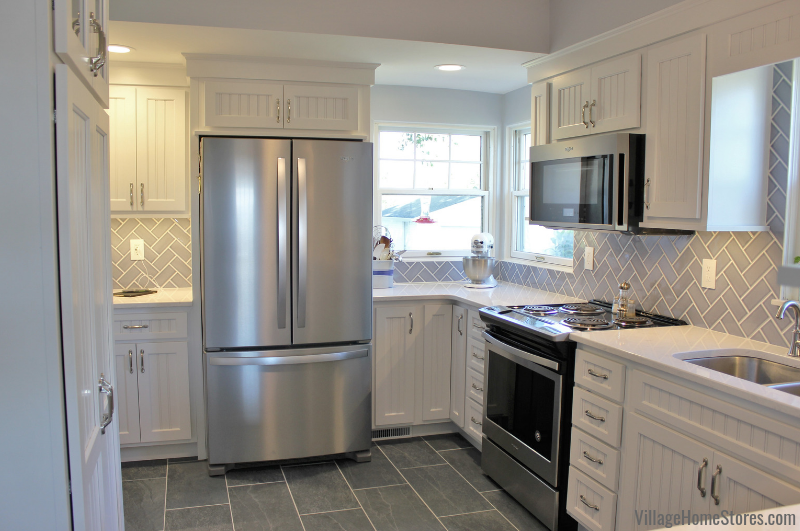 Open and bright with finishes that are gray and white. 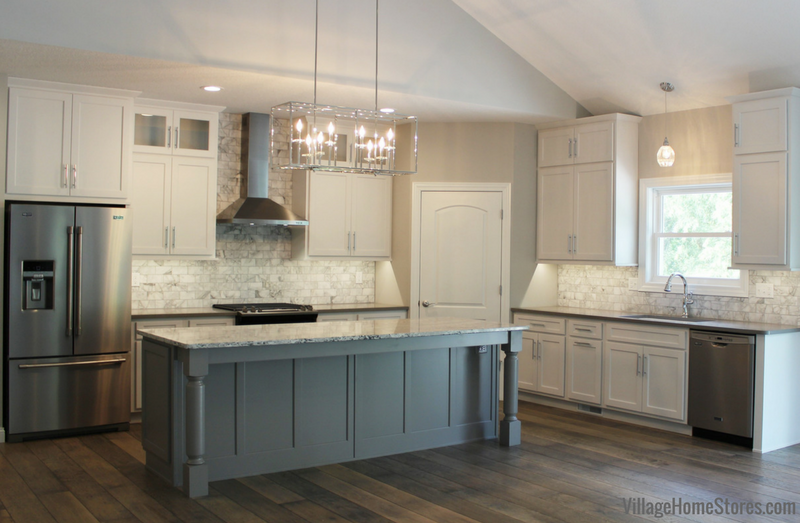 Take a look at the stunning kitchen in this new home built by Hazelwood Homes in Moline, IL. Transitional in style with chic and glamorous details like marble and a touch of sparkle. This kitchen blends cool colors from a gray palette and a variety of textures. 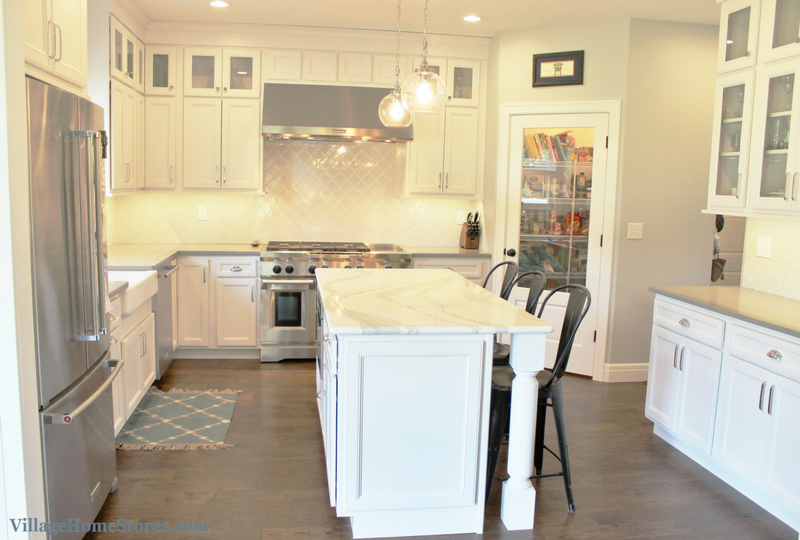 The perimeter cabinetry is painted white and the island is a painted “Fog” finish. 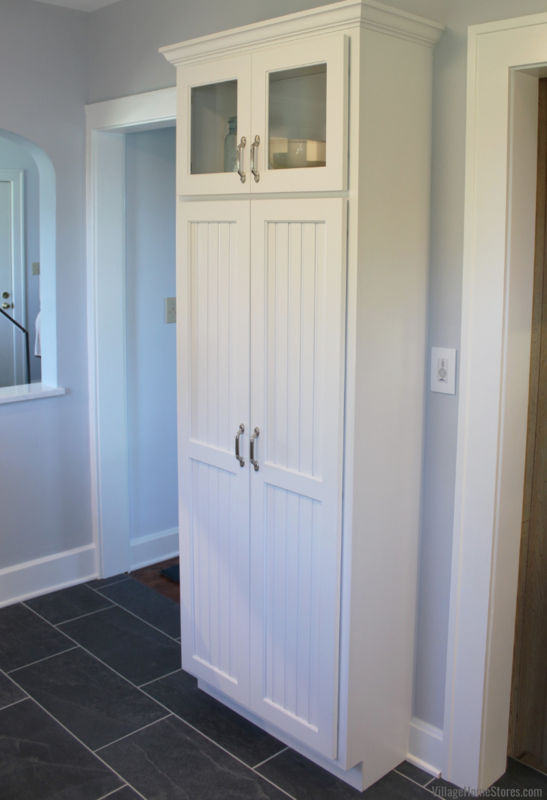 The cabinetry is from our Koch line and the simple flat-panel “Prairie” door has been selected. 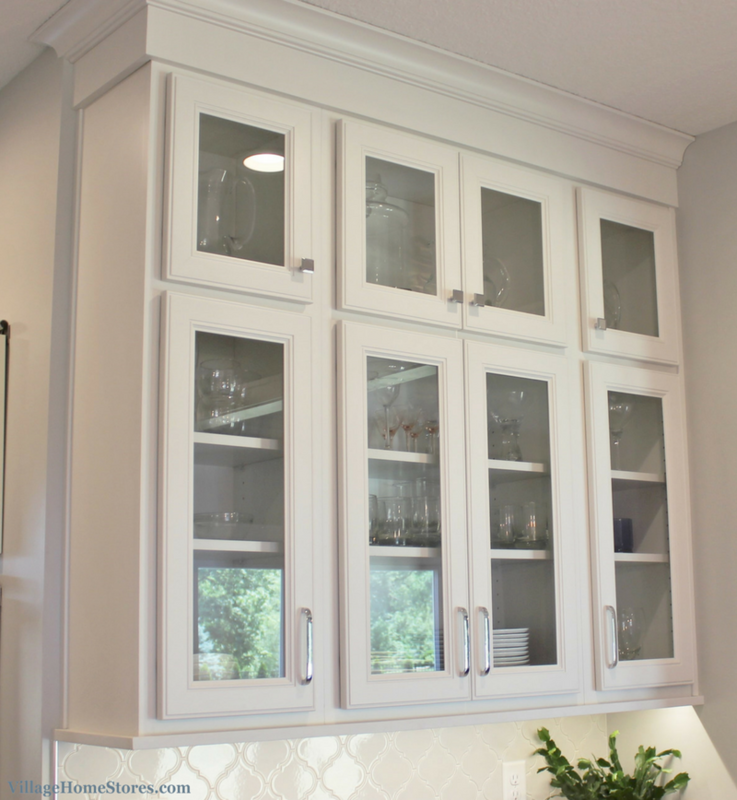 The top section of cabinet doors have glass center panels for a clerestory look. Even with every surface from floor to ceiling covered, this range wall still stays feeling open and airy. 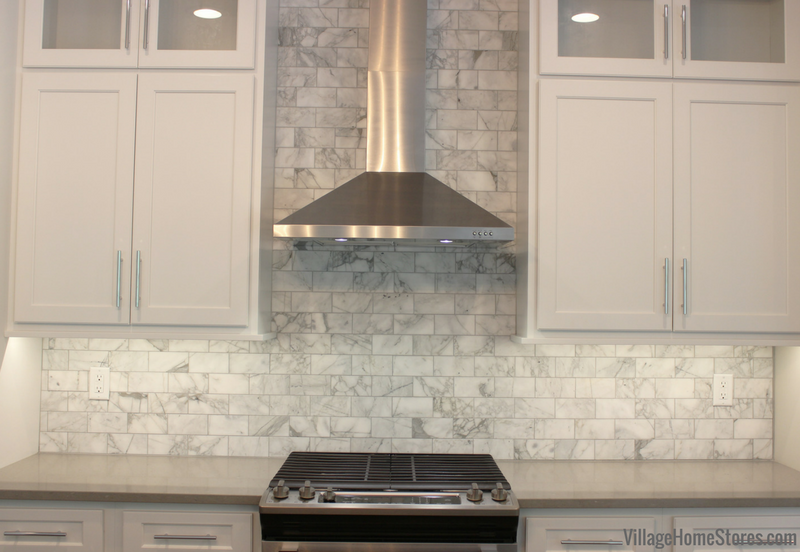 Venetian Calcutta marble tiles in a subway tile shape fill the backsplash area and extend behind the chimney-style hood on up to the ceiling. 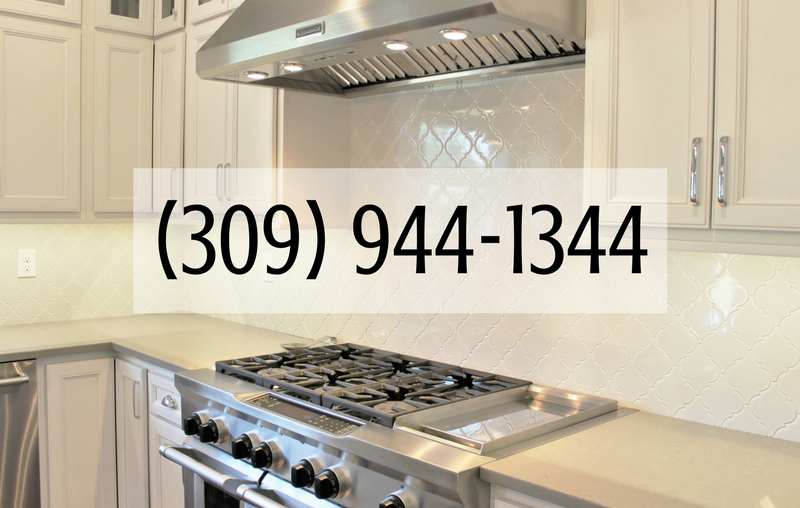 A 30″ wide wall mount chimney hood with 400 CFM’s of power sits above a front-control slide-in gas range by Maytag®. This front-control style range includes true convection features and fits any standard 30″ wide opening for an existing range. “Slide-in” ranges used to require special countertop installations and surroundings. 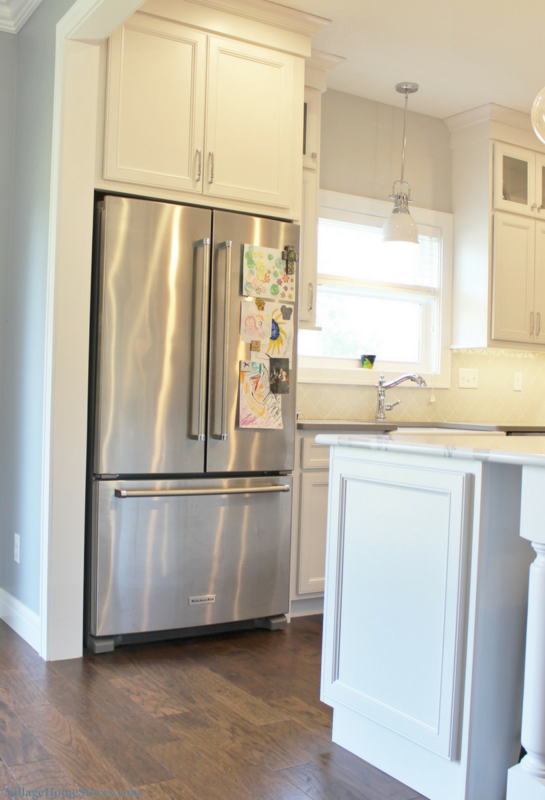 With the new FIT System from Maytag®, this unit will slide right into an existing opening for a custom look without hassle. 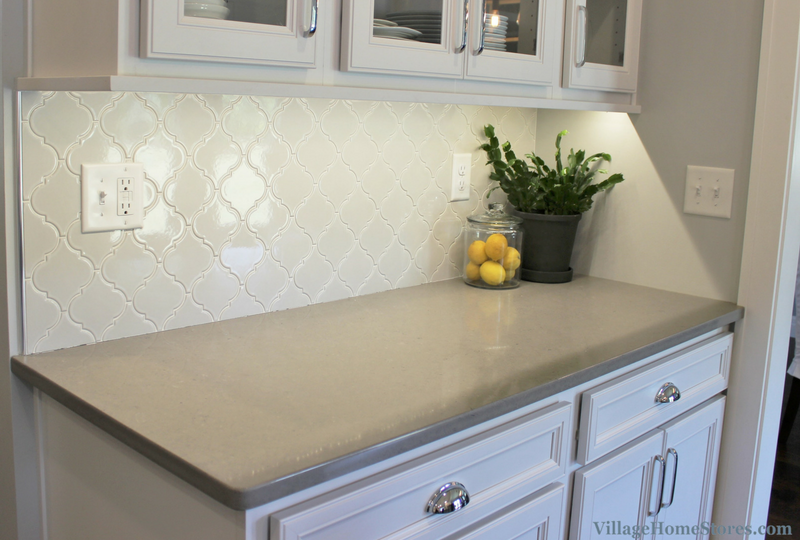 The look allows your tiled backsplash the full area to be showcased. Five gas burners on top and 5.8 cu. ft. of capacity inside the oven, this range is perfect for any serious cook. Convection features offer up a consistent temperature and with an added third element surrounding the convection fan in this unit, the entire cavity can heat up faster. That means a faster preheat with Power Preheat! Convection is easier to use than you think. Just ask one of our expert sales team members about how it works. We included a full-depth refrigerator in this kitchen design (notice the projection out into the kitchen in image below). Such a beautiful space. 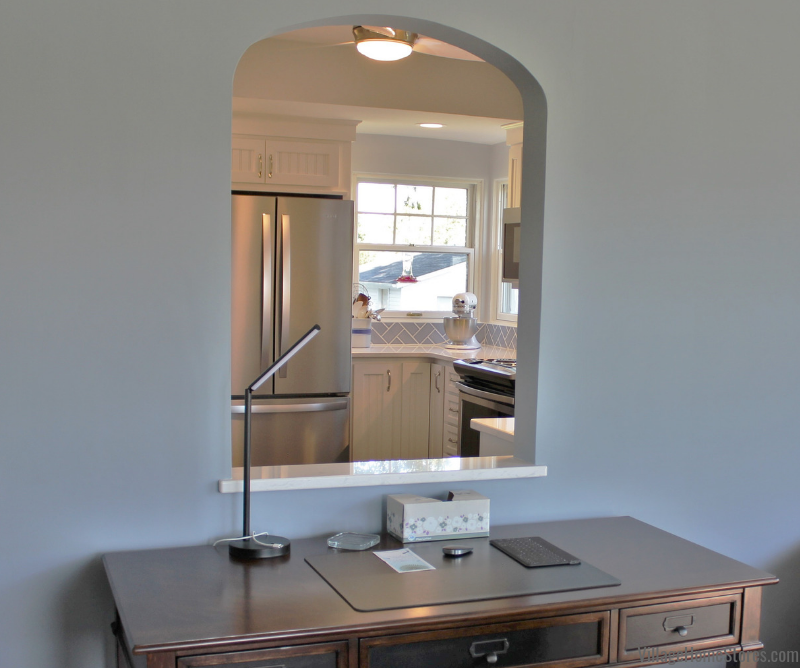 The second wall of cabinetry includes the kitchen sink, dishwasher, and a window. That same fingerprint resist stainless finish is also on the dishwasher. 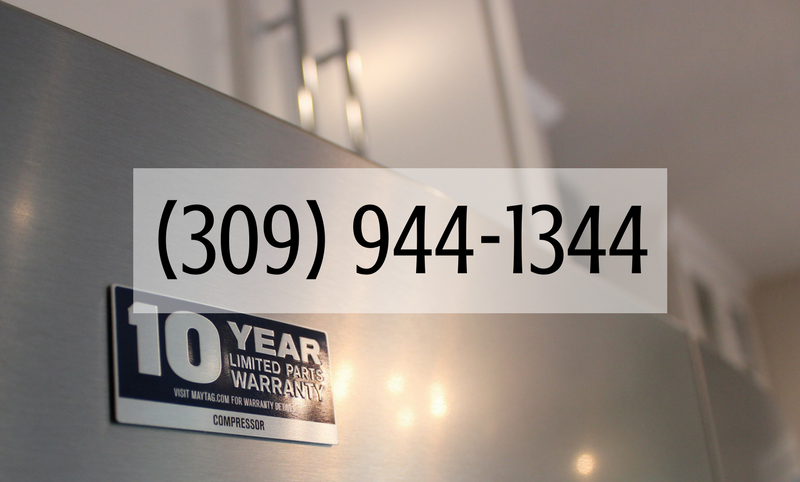 Maytag® takes their warranty a step above others in the industry by including a 10 year warranty on the major components of an appliance (i.e. the cooktop burners, oven burners, cast-iron metal grates, refrigerator compressor, etc). 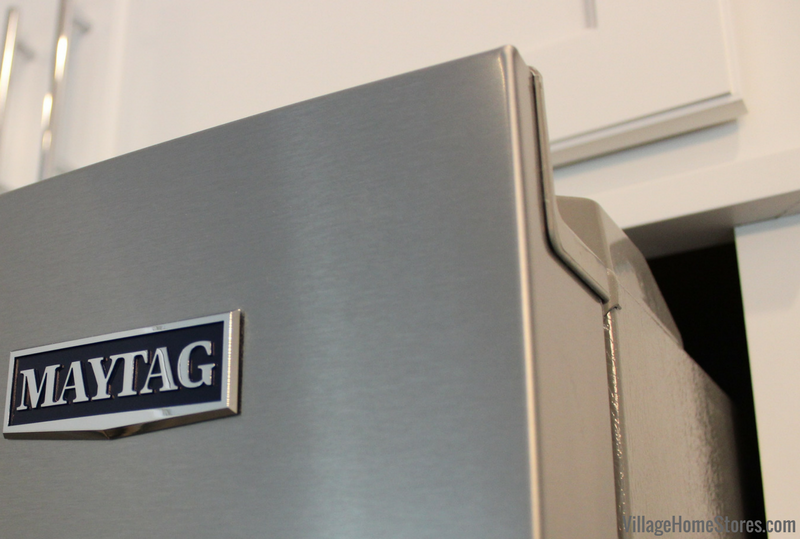 Ask your Village appliance expert what is covered on your new Maytag® appliances! 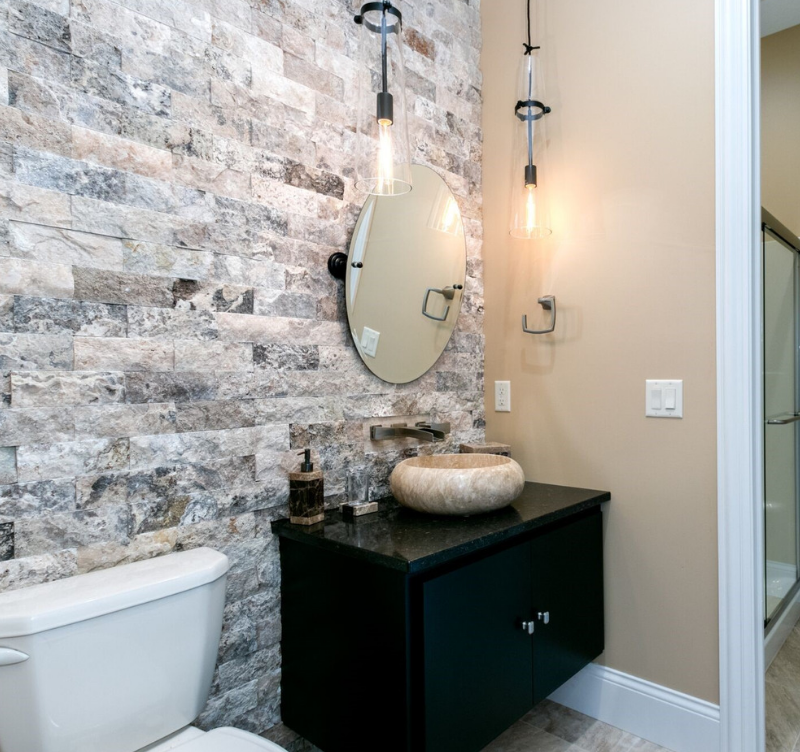 Tile transitions and installation designs can be just as much or a decision as selecting the material. 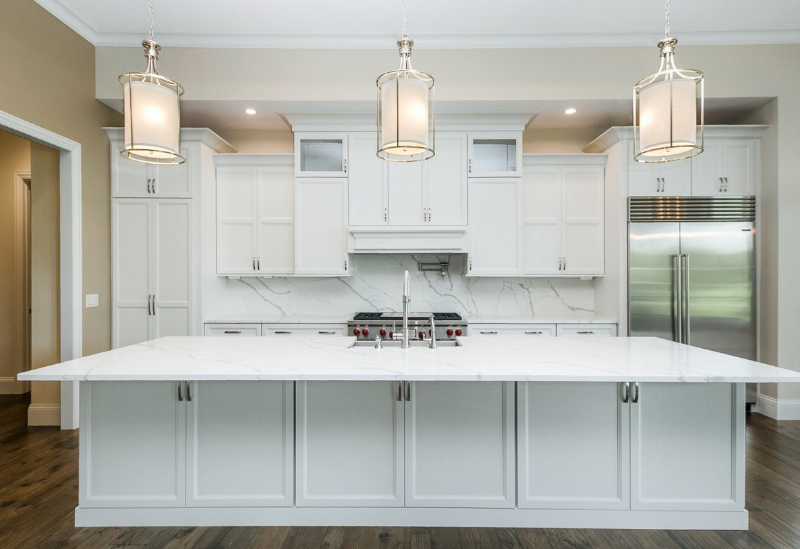 Our surface experts work with your kitchen designer to give you the best application of your selections for the best end result. 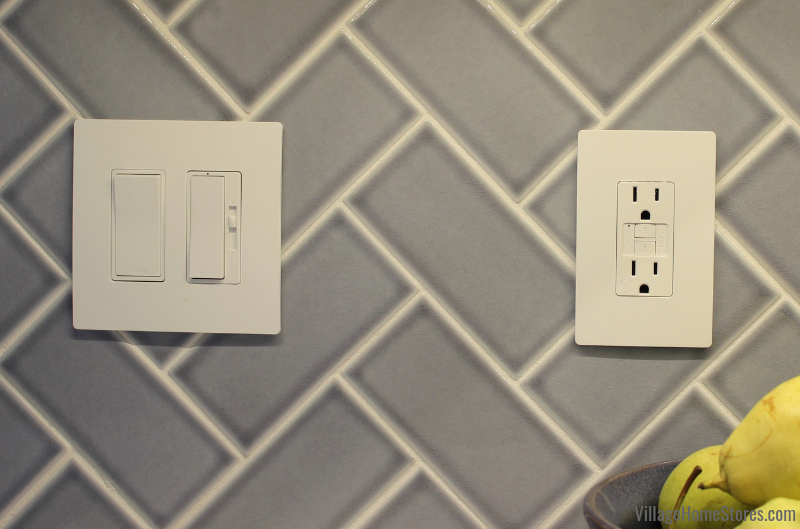 The range wall in this kitchen is between two walls making it easy for tile to end. The sink wall required what is called a “Schluter® strip” (shown below). 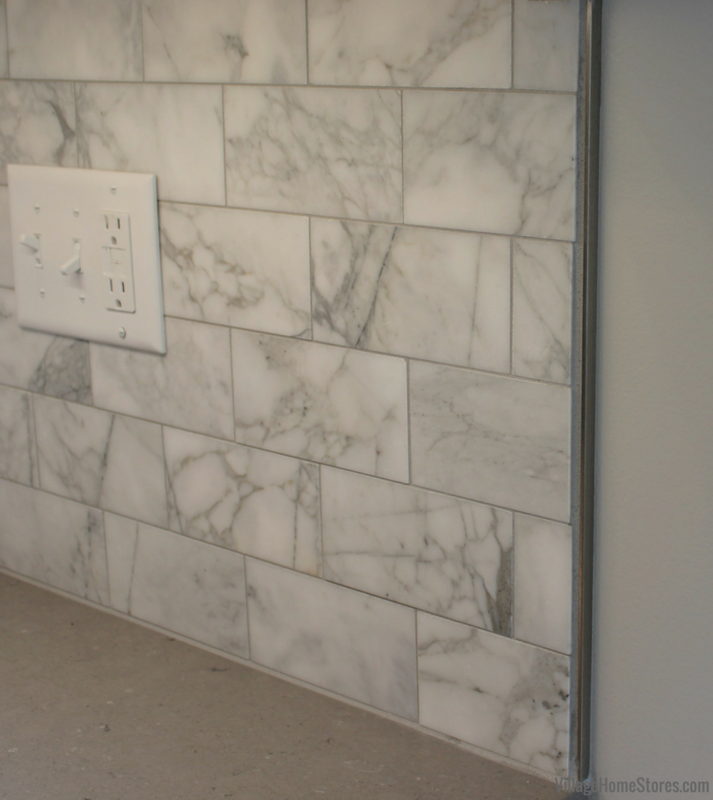 This metal channel allows a clean edge for the tile and grout to end at. Available in many sizes and finishes, this element is available to be bid for all of our installed jobs as well as for our DIY and cash-and-carry customers. The kitchen island in this design has cabinetry facing the range wall and an overhanging area along the back for counter-height seating. Fossil Gray quartz counters give an almost cement-like look to the kitchen’s perimeter and lets the pattern of the large island top shine. The kitchen island shown below measures roughly 8 1/2 feet x 3 feet in size. The Summerhill™design by Cambria® Quartz is full of neutral grays and whites plus subtle sparkles. 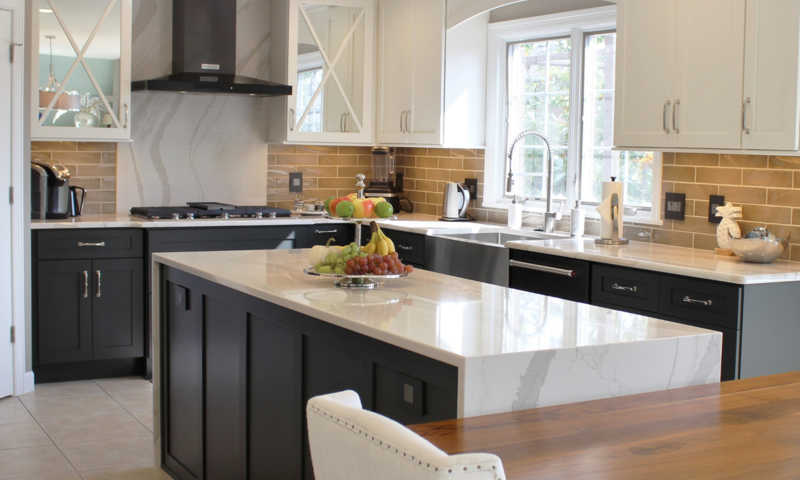 When shown in a large piece (like this island), it has a huge design impact. 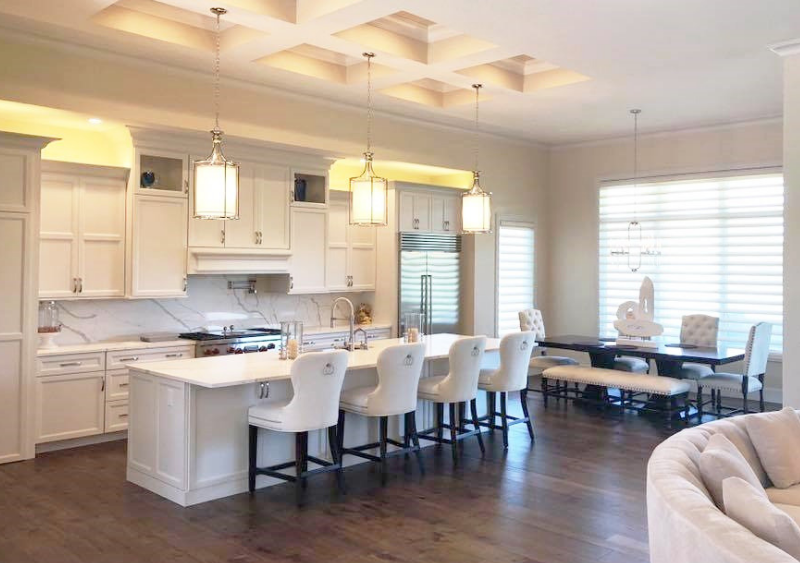 Hanging above the kitchen island is a “Morgan” 8-light fixture from our Capital Lighting line. Sleek and chic, the Morgan light is a Polished Nickel finish with square K9crystal bases at each candlestick-like base. The light is the perfect size and scale for the island. With the caged design, it keeps the entire look open with a clear sight through to the kitchen. A smaller version of that same island light hangs right around the corner at the front door entry. Don’t forget that our new construction customers can bundle their purchases throughout our store to earn FREE lighting for their new home. Find details about this ongoing program here. The flooring throughout this Moline, IL Great Room is an engineered wood floor from our Canoe Bay line. This American-made product comes backed by a limited 25 year warranty. The wide, long planks in this space offer a stunning stage for the whole Great Room to be showcased. See the entire album of photos from this home here over on our award-winning Houzz page. There you can see the bathrooms, many lighting selections, and even a lower level kitchenette area in this same home. If you are building a new home we are ready to help you make it into the space you have been dreaming about. We work with you and your builder to keep you on track and on budget. 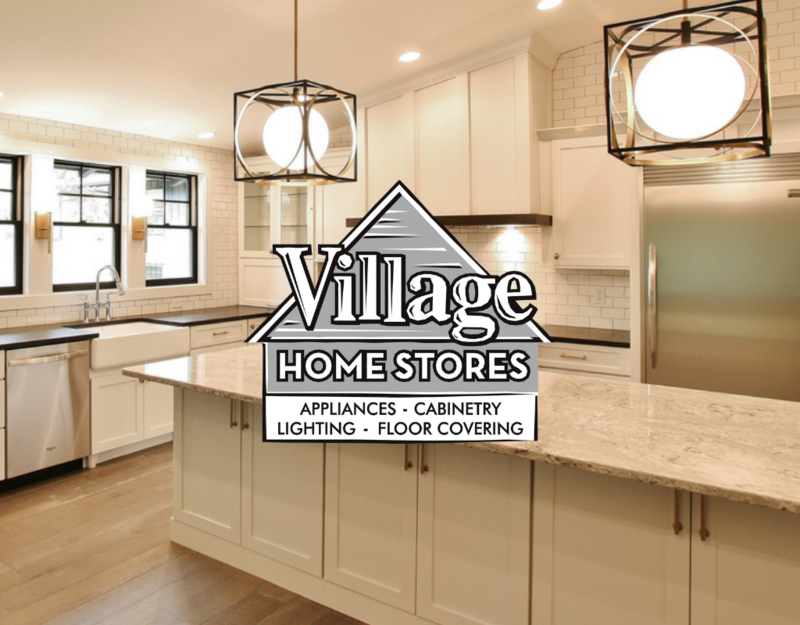 Contact the New Construction design team at Village Home Stores today. 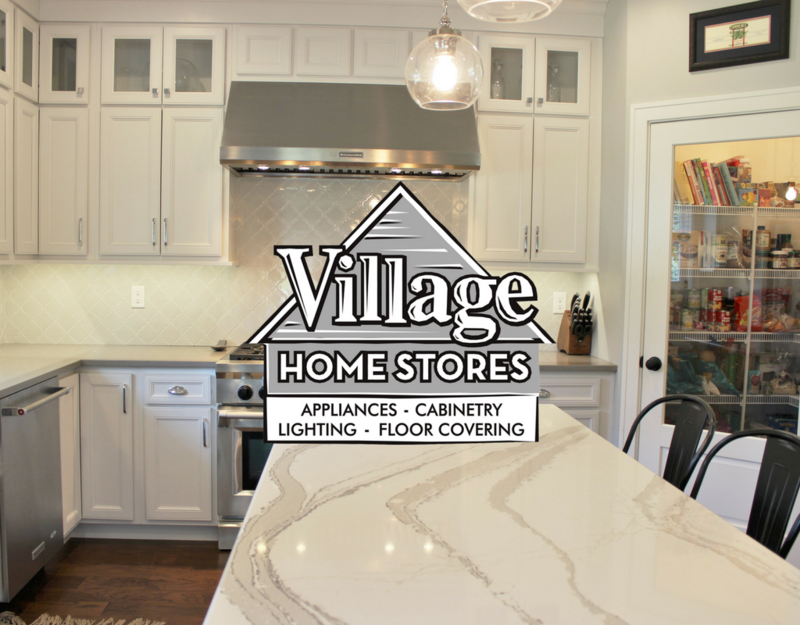 Located at 105 S State Street in Downtown Geneseo, IL call us at 309-944-1344 or email is at info@villagehomestores.com for an appointment. We are so blessed to be able to become a part of the building process for our customers. Anything we can do to make that process more easy and of course exciting is such a great part of our work. This new home built in Coal Valley, IL by Hazelwood Homes is one of our favorite recently completely projects. This busy family wanted a stylish space but one that can be enjoyed and lived in as well. 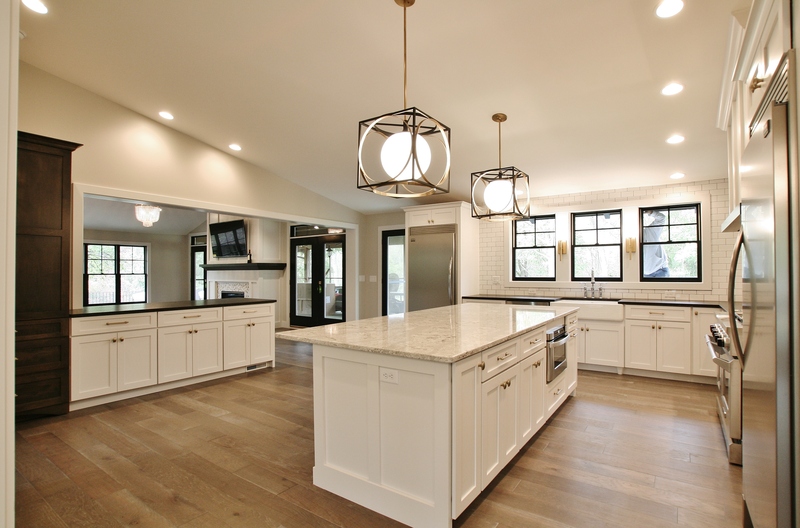 An “open concept” layout is certainly the direction most new home plans are going. This home includes a great room that opens up into a dining space and then the kitchen. Now casual family moments and even more formal meals can all be shared within this family-friendly space. Having the kitchen within reach of the play areas and main social spaces of a home can be so helpful for families with younger children. Even though we are calling this kitchen “family friendly” we still believe it still could grace the cover of a glossy magazine don’t you? 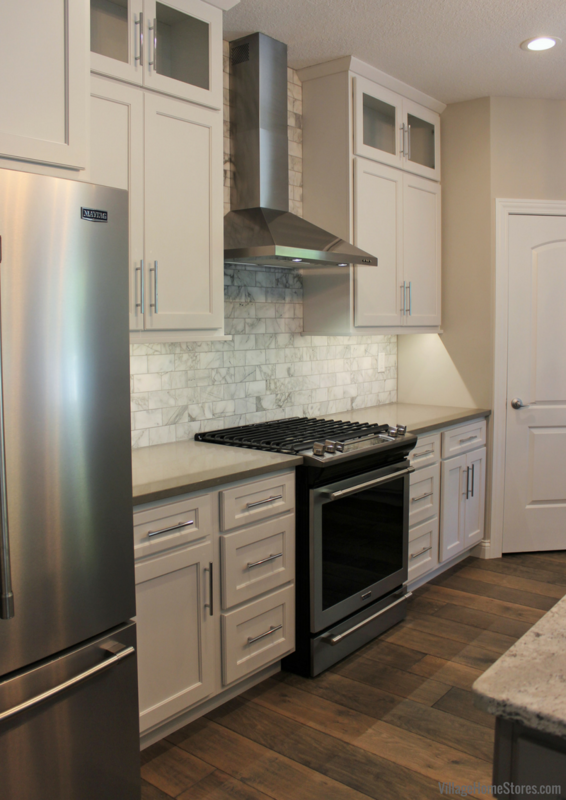 Flat-panel, “Ridgegate” cabinets in a “White” paint are a classic choice from our Koch line. 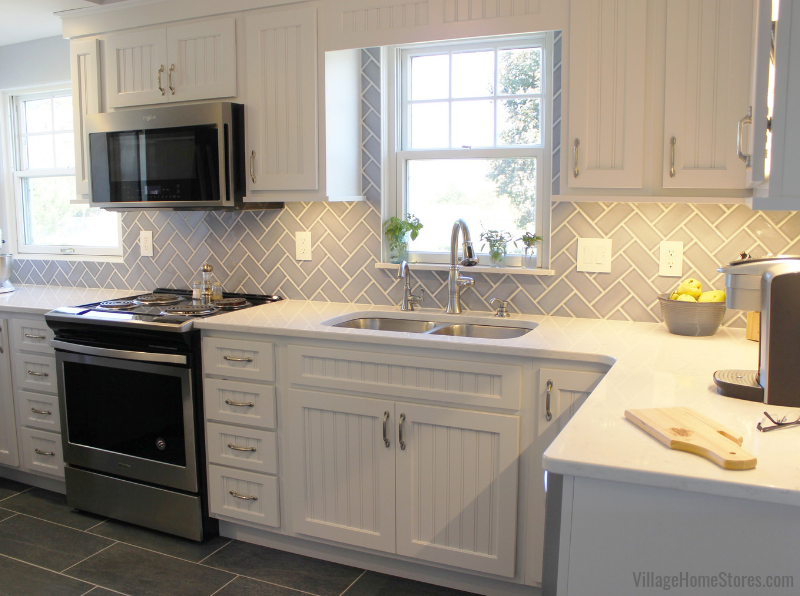 Modern Farmhouse details like Hickory hand-scraped wood floors and a farm sink help to nudge this Transitional style kitchen into the Farmhouse Transitional style category. 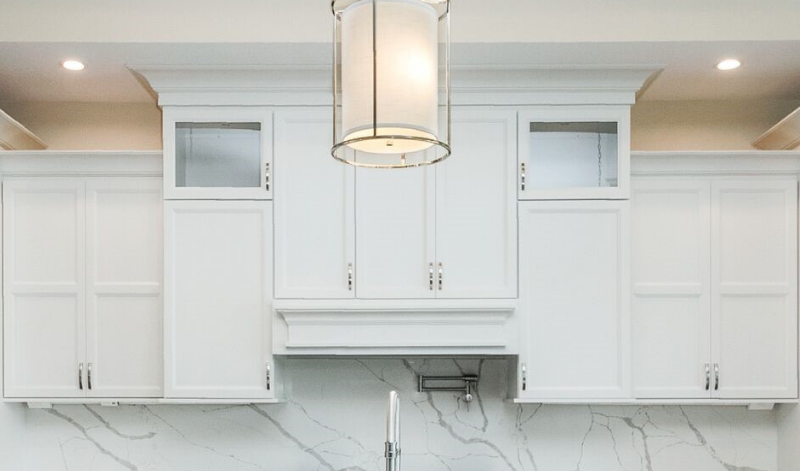 Wall cabinets stretch just shy of the ceilings leaving enough room for a stacked crown molding detail. 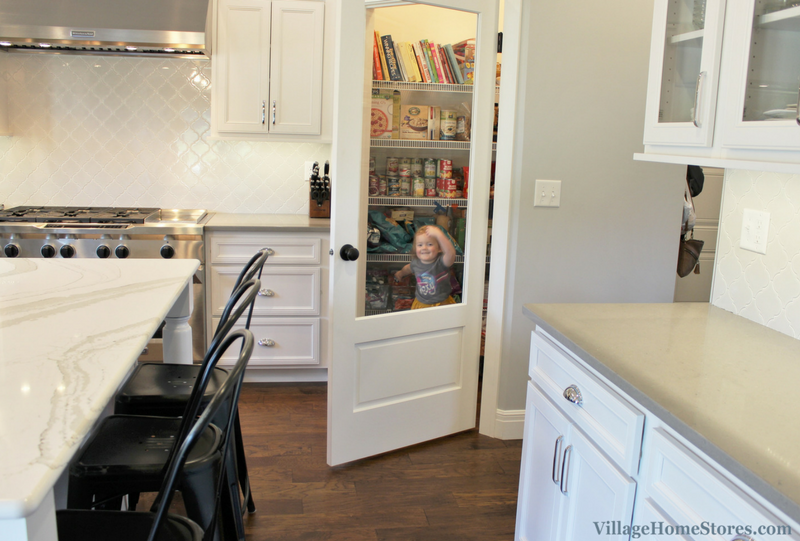 So much storage throughout plus a glass-door corner pantry area (shown below with someone sneaking a snack). 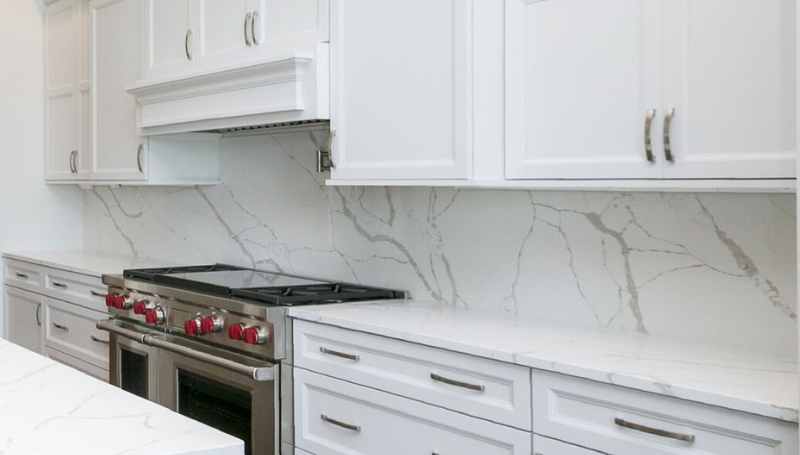 “Fossil Grey” quartz counters mimic an almost cement slab look on the perimeter of the kitchen and Cambria® Quartz “Brittanicca” graces the center of the kitchen on the island. 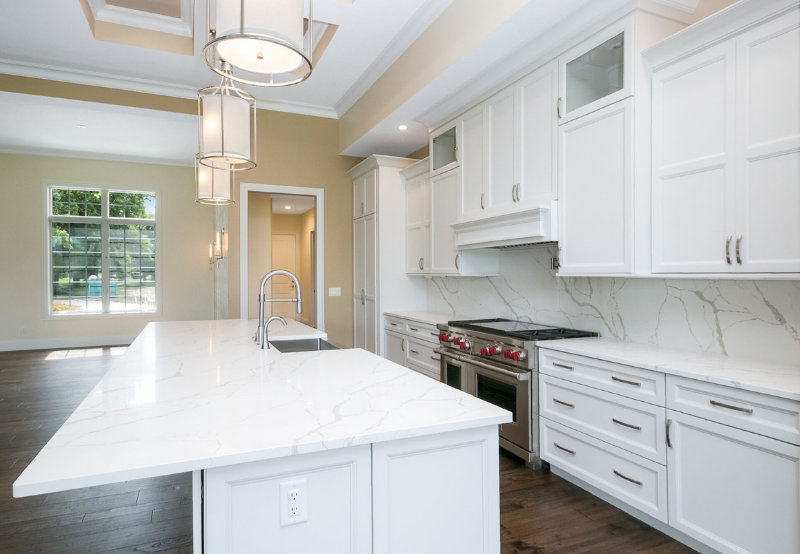 This beautiful look of natural stone suggests marble with the no-maintenance appeal of Cambria®! 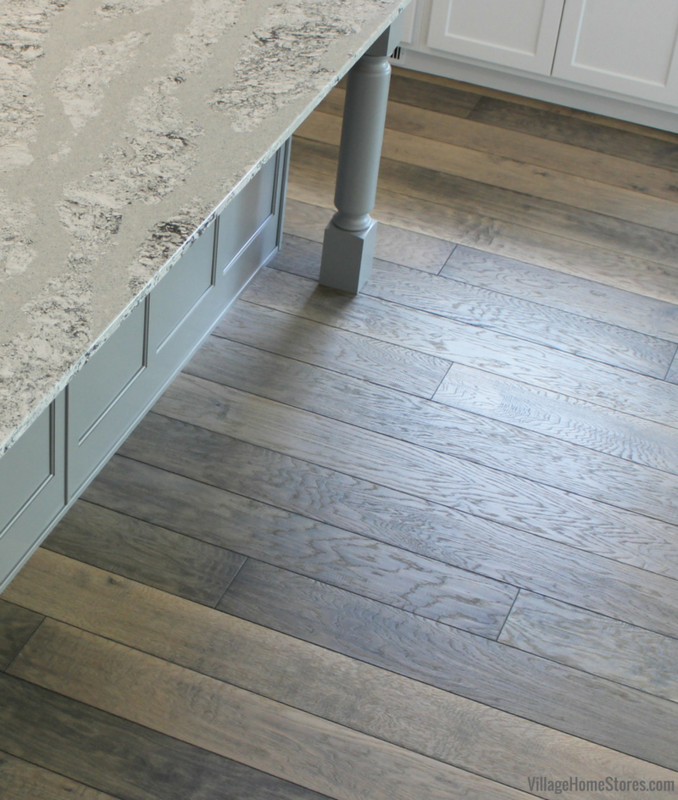 This non-porous, durable product is a fantastic choice for counters in this busy family hub! With the wall cabinets so tall, a stacked look to the doors was desired to avoid long, exaggerated doors to open and close. Many kitchens with this look include floating shelves. The look can be great, but difficult to keep clean. You also become limited to weight the floating shelves may hold. 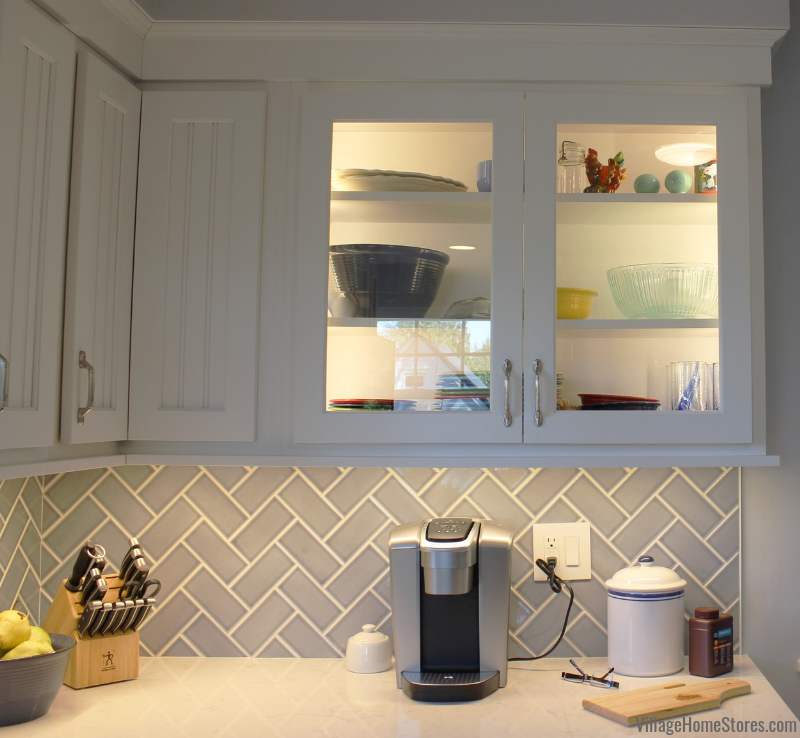 Consider glass-front cabinets as an option to still give an open look. 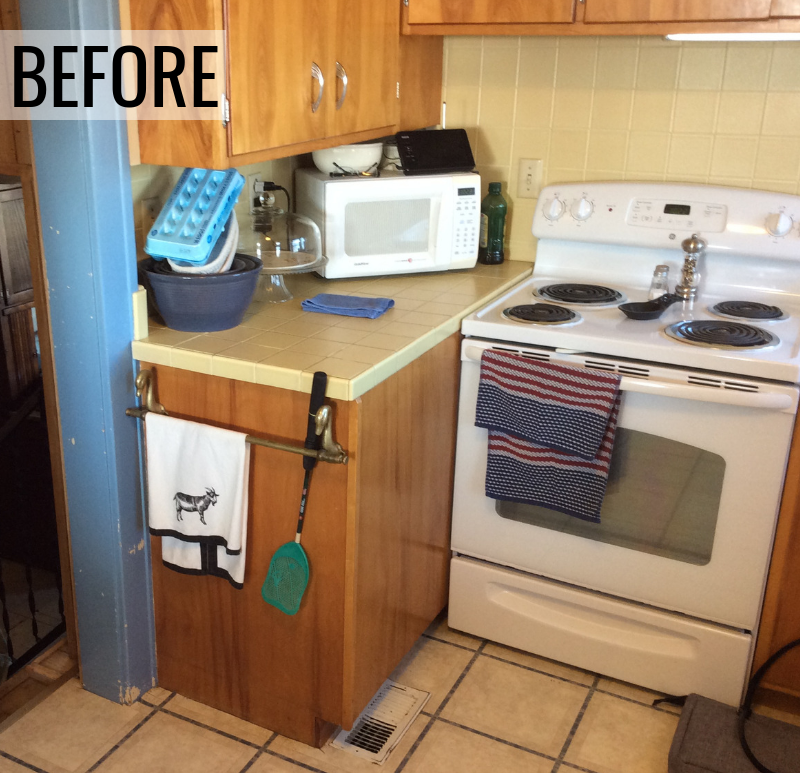 One section of this kitchen design has been arranged as a built-in hutch area (see above). The main kitchen perimeter includes just glass inserts in the top section for a “clerestory” effect. This hutch area section includes glass door inserts entirely. The finished look is clean and stylish. We love how the dishes and glassware are able to be displayed but kept from dust. 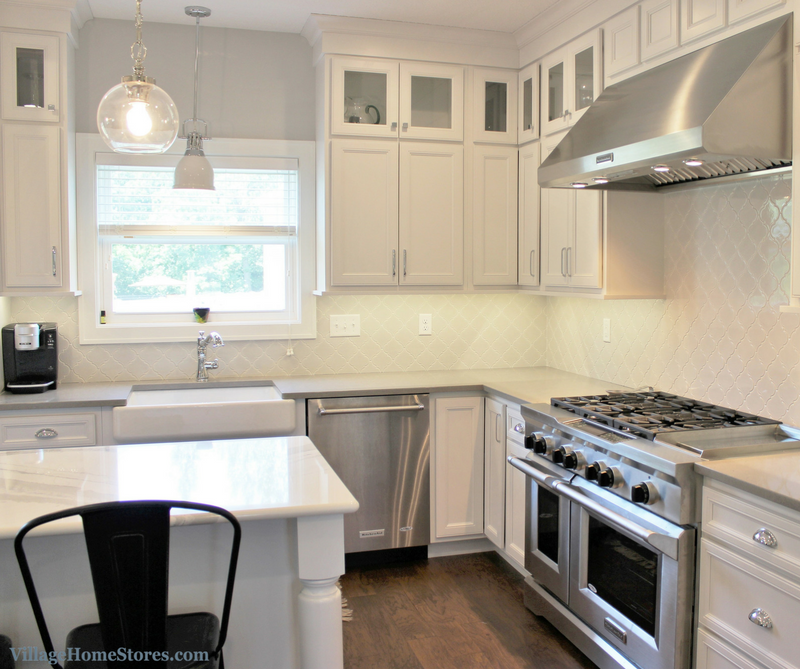 The kitchen backsplash adds to the white-on-white space a new texture and design detail. 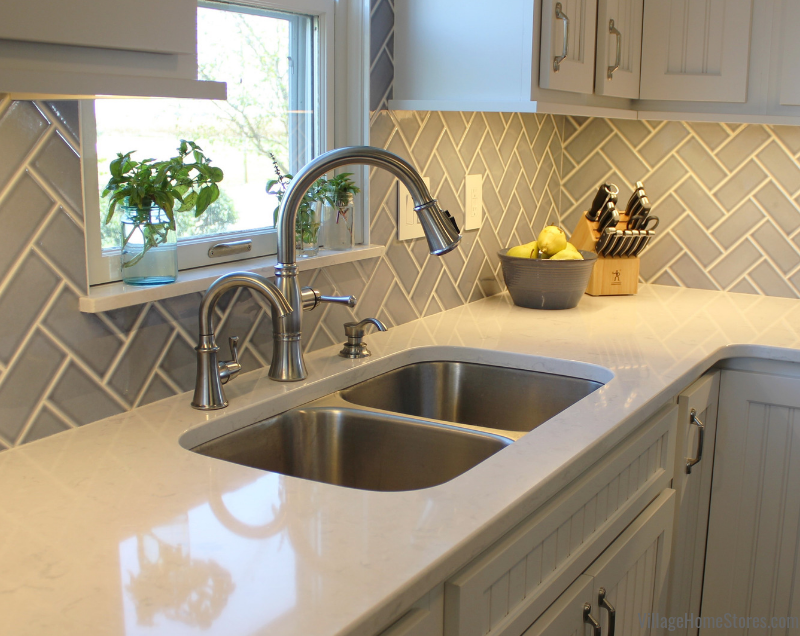 An “Arabesque” shape tile in a glossy “Coronado” color helps add curvy intertwining lines to soften the look of the kitchen. 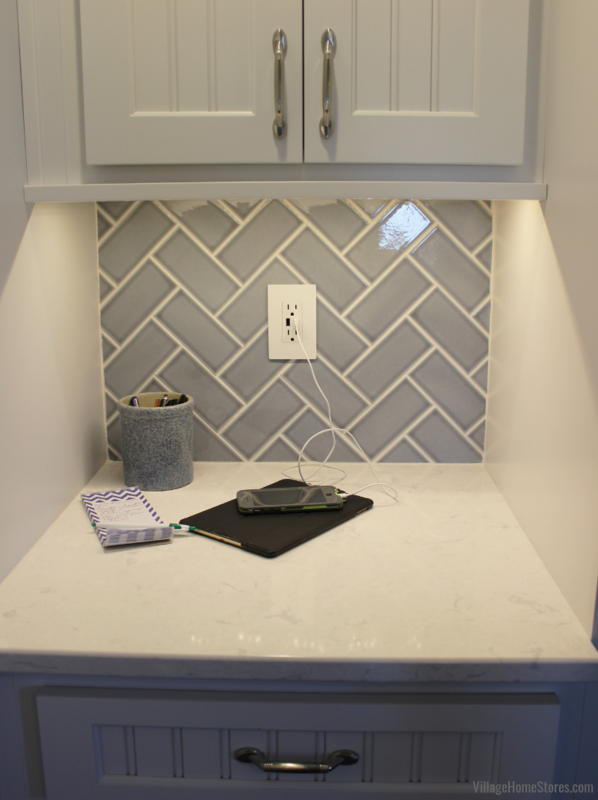 Of course we can never mention a stunning backsplash without also reminding you it is being washed with light by our Diode undercabinet lighting system. 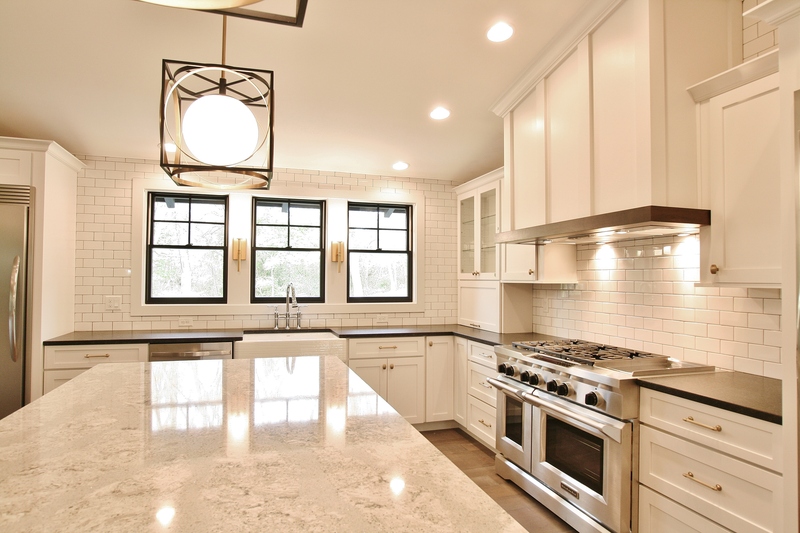 There is no better way to showcase your new kitchen investments than with this low-voltage lighting. The refrigerator for this kitchen is located right at the entrance from the Dining area. A KitchenAid® 20 cu. 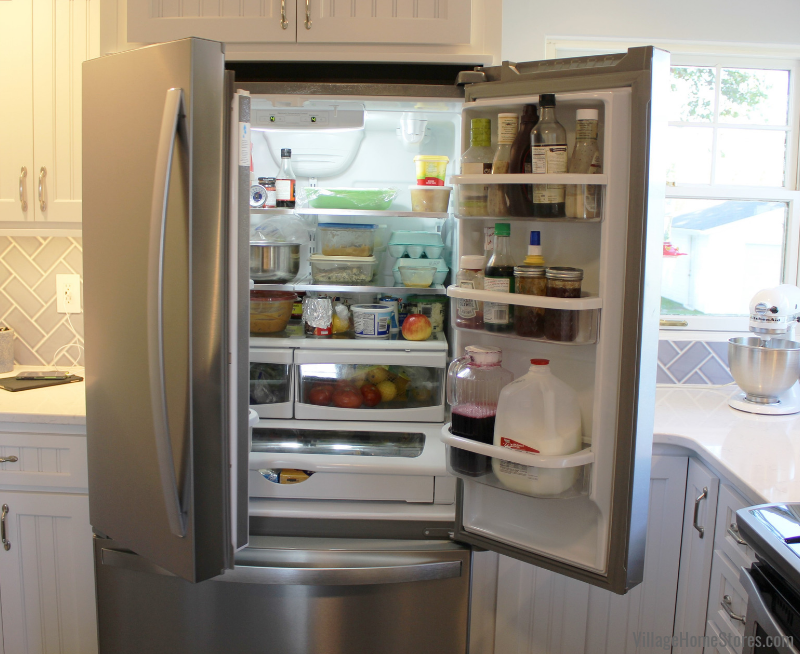 ft. counter-depth model has a deep cabinet above and a refrigerator end panel on the right side of the unit for a built in look. A “family-friendly” kitchen without water in the door?!? 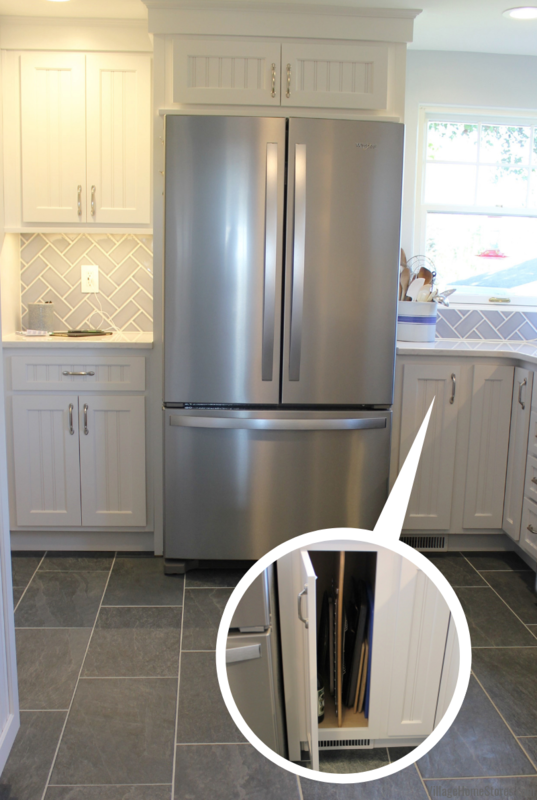 Well, this French Door unit may be shallower to allow maximum walkway throughout the kitchen…but it does still have water and ice! The filtered water is just inside of the door and an icemaker is located down in the freezer drawer. Including the icemaker and ice storage down below frees up more space in the fresh food storage area that can become quickly crowded in a counter-depth model. 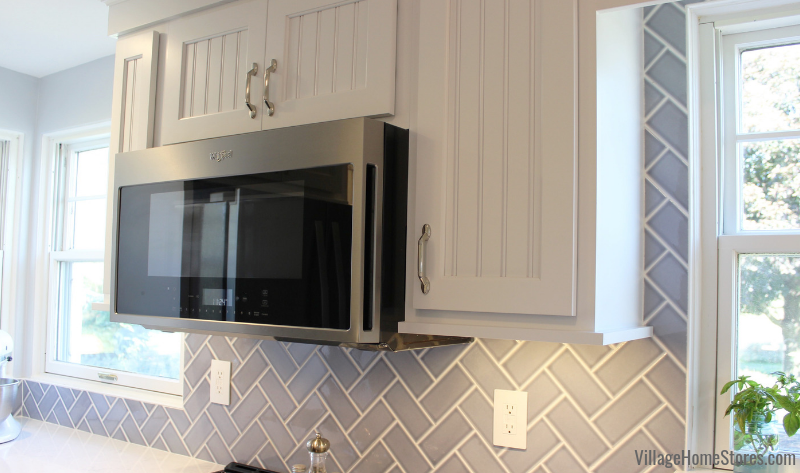 Cooking and baking just got a lot more stylish and easier for this family as well! 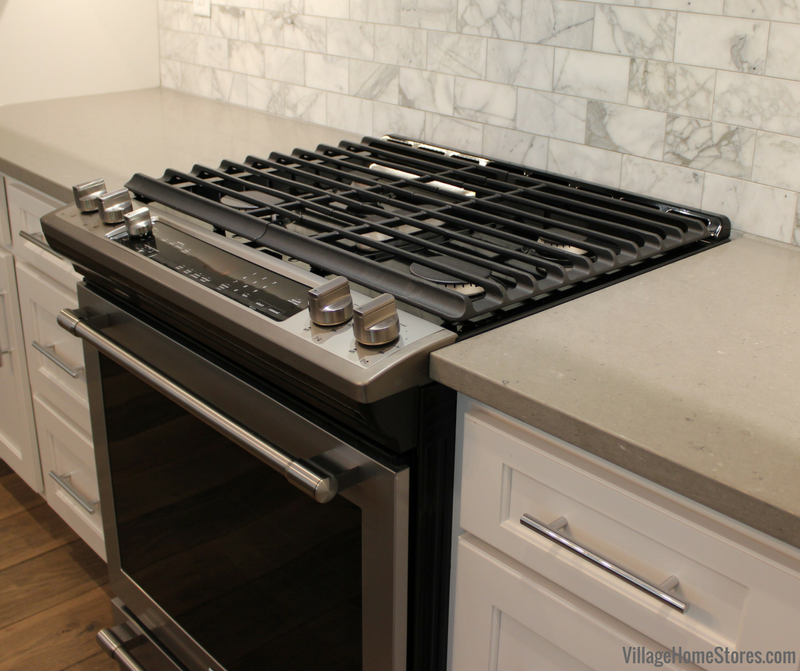 A 48″ wide commercial-style KitchenAid® gas range is the focal point of the entire kitchen. With two ovens and 6 burners this duel fuel range can prepare a meal for the smallest or largest of crowds! The ovens include Convection baking, roasting, and broiling settings plus the KitchenAid® EasyConvect™ takes the intimidation and guesswork out of convection. 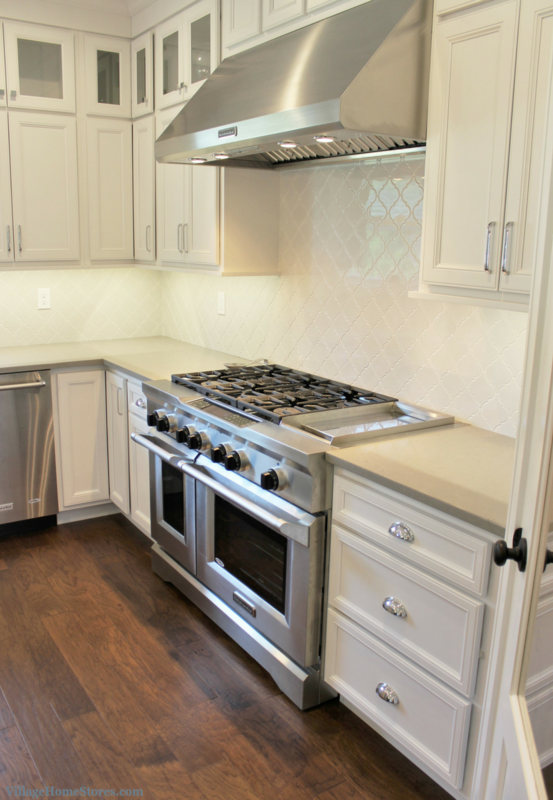 An easy-to-clean electric chrome griddle is also a part of this 48″ wide unit. What an all-star appliance choice! 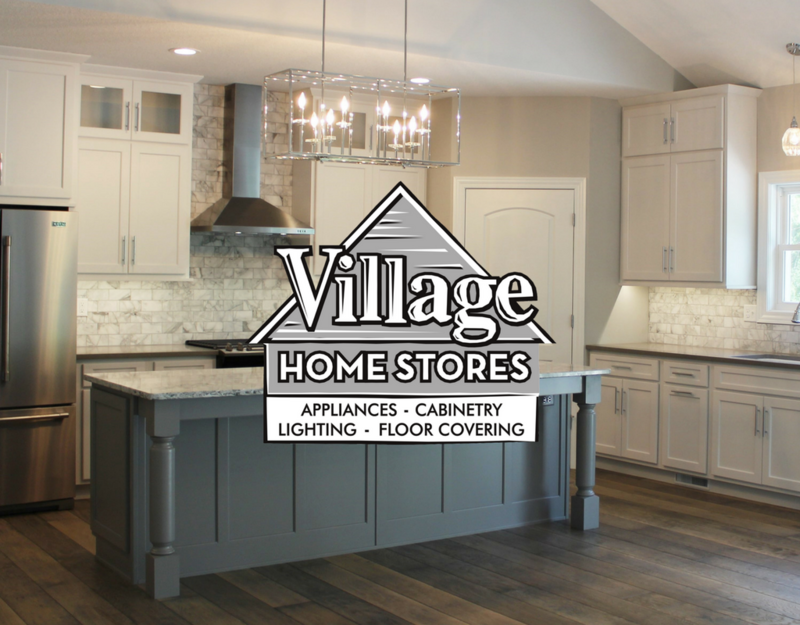 Village Home Stores isn’t just Cabinetry and Counters. We also offer Appliance Sales and Service, Lighting, Flooring, and Blinds and Shades. 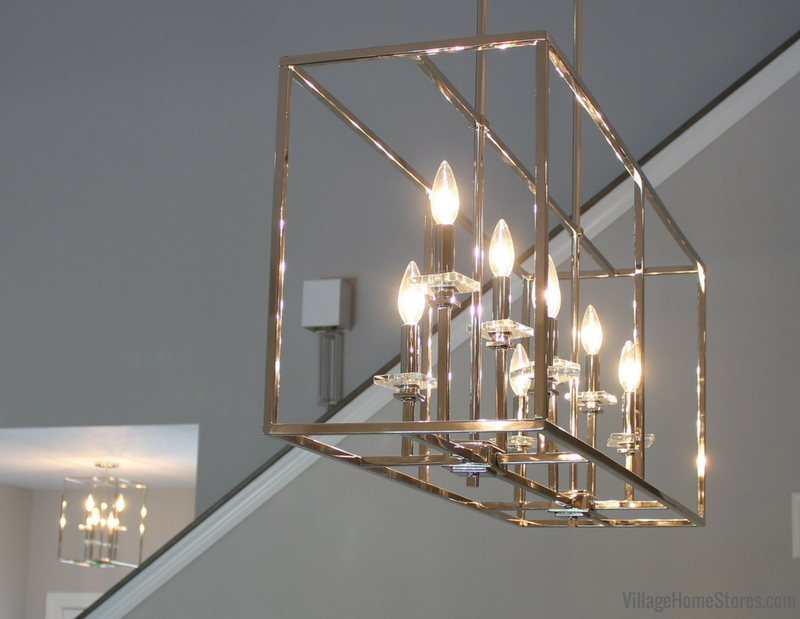 Did you know that when you are building a home you can purchase the products you need from all departments of our store and end up receiving credit for free lighting because of it!? We offer a Local Low Price Guarantee plus a lighting bundle that can save you a significant amount of money! 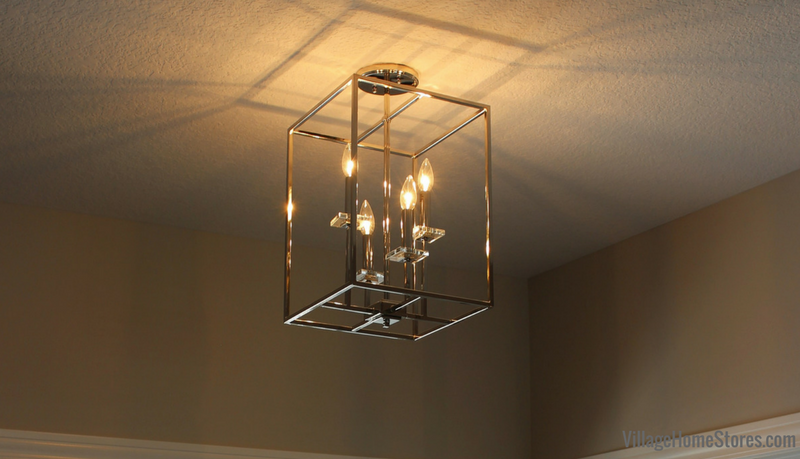 We love the lighting that was selected throughout this entire home. 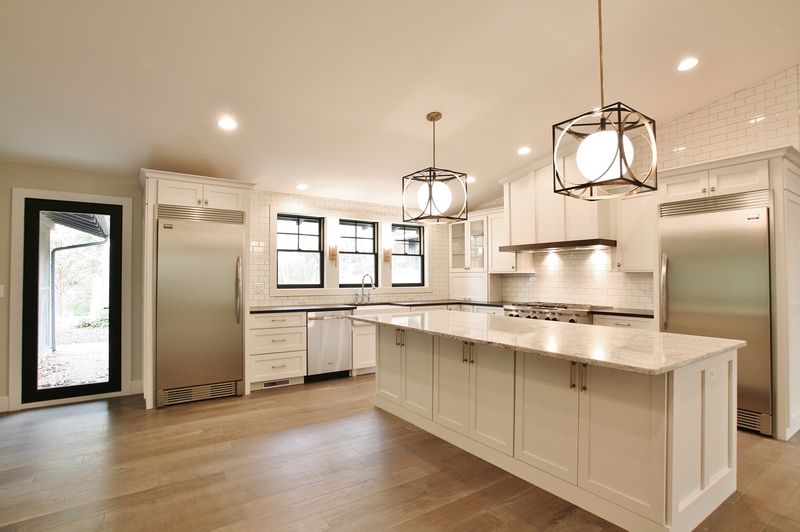 The kitchen lighting is so perfectly paired with the style of the space. 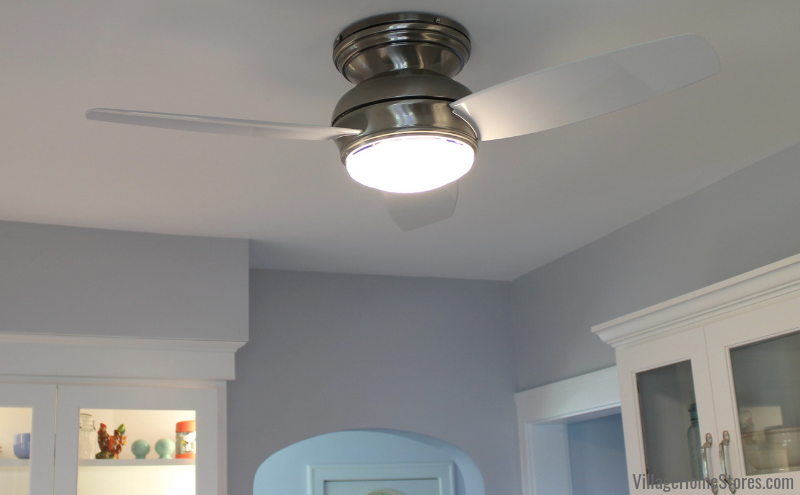 It keeps the space feeling light and bright and doesn’t distract from the other focal areas of the kitchen. 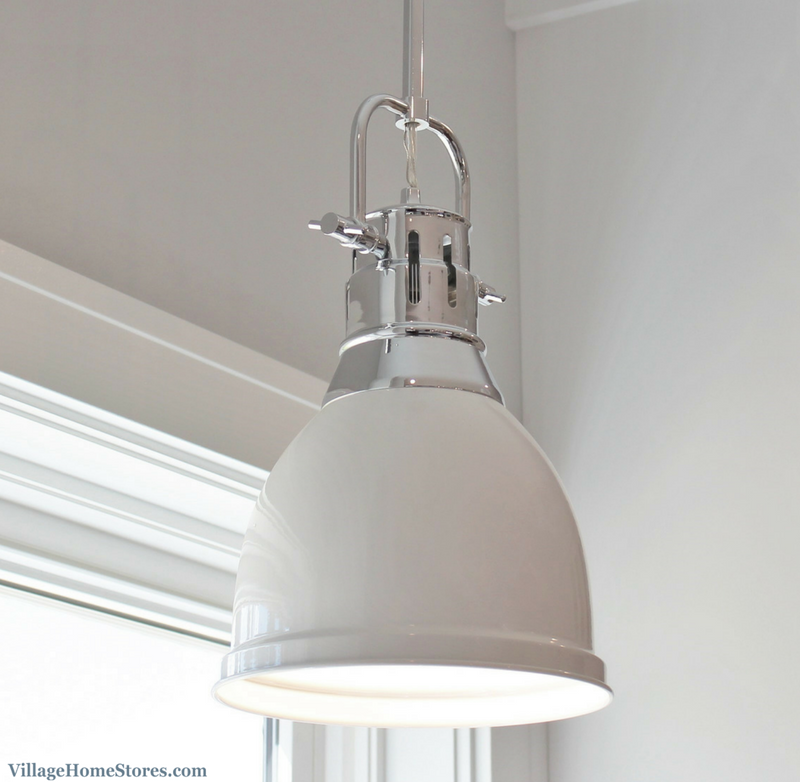 Above the farmhouse style kitchen sink is a white and chrome pendant light by Golden Lighting. Working with an expert lighting staff when building makes the designing and selection process easier on you. Don’t spend months and months driving all around the area to handfuls of specialty shops. Come to the experts at Village Home Stores. 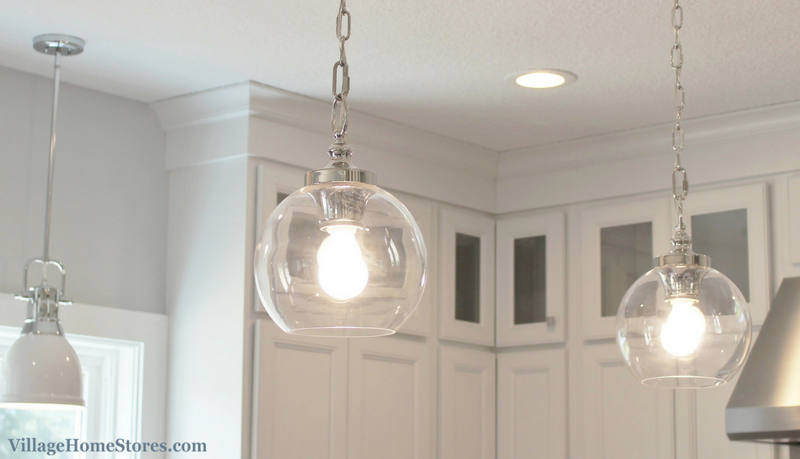 Above the kitchen island hang two “Tabby” glass mini pendants from our Feiss line. We love how the clear glass keeps the space feeling bright and open. 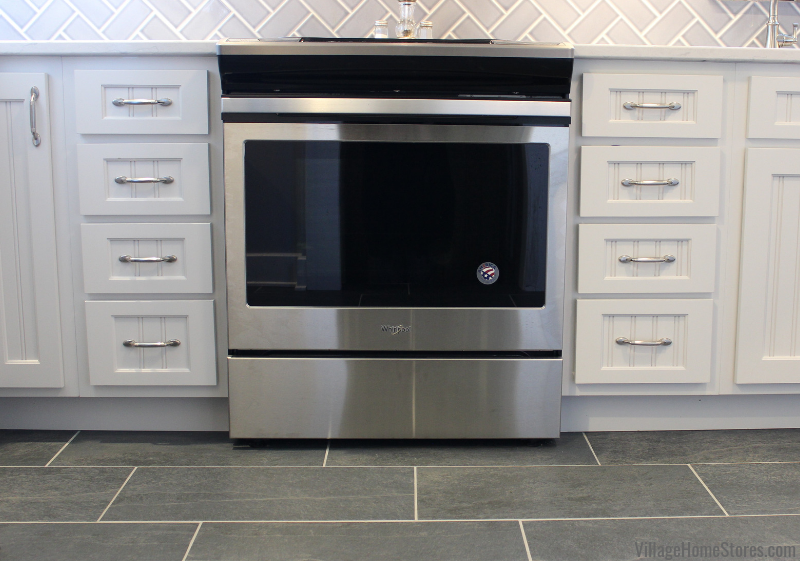 The kitchen island includes a microwave drawer from Sharp®. This microwave option is wonderful for busy families. Easy to reach and plenty of counter space above it, microwave drawers can be a wonderful option for your kitchen design. The microwave controls for this unit can be found on the tilt-out panel on the top frame of the unit. This sleek new design allows for the Sharp® unit to pair well with many appliance styles and brands. 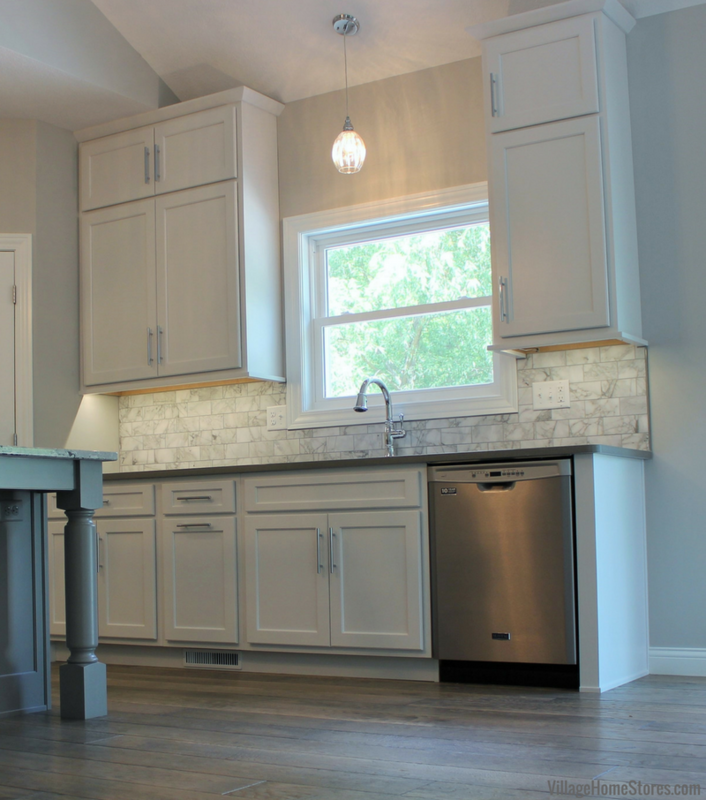 See the full album of photos from this new home in Coal Valley, IL over on our award-winning Houzz page right here. There you will also see some of the other spaces, materials, and lighting in the new home. To learn more about Hazelwood Homes visit their website here. We work in-depth with all of our new home customers and their contractors to help the end result be a finished home everyone is happy with. 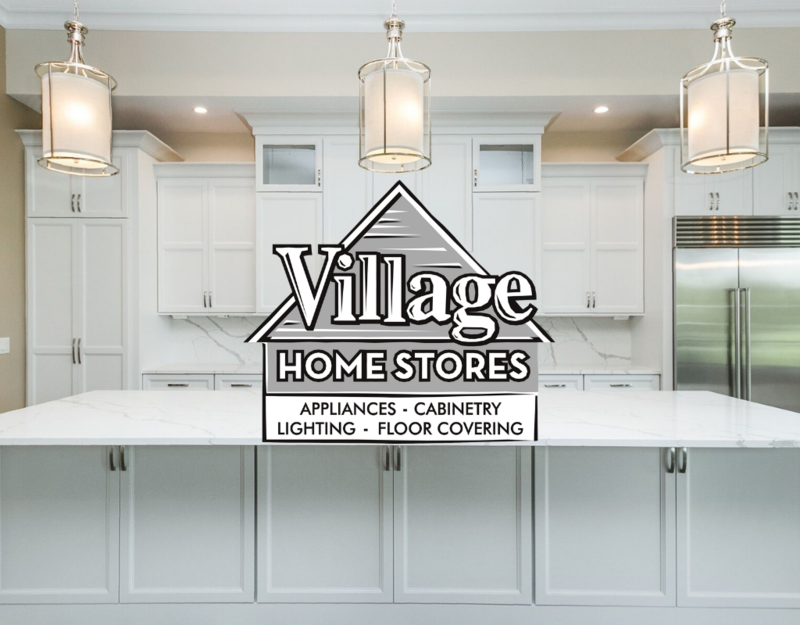 Village Home Stores is your locally-owned one-stop shop for everything for your home. Contact us today to schedule an appointment with our New Home team (309) 944-1344 or by completing this online form. We can’t wait to see the plans for your new home come to life! We love the black trim detail added to this Bettendorf, IA home. 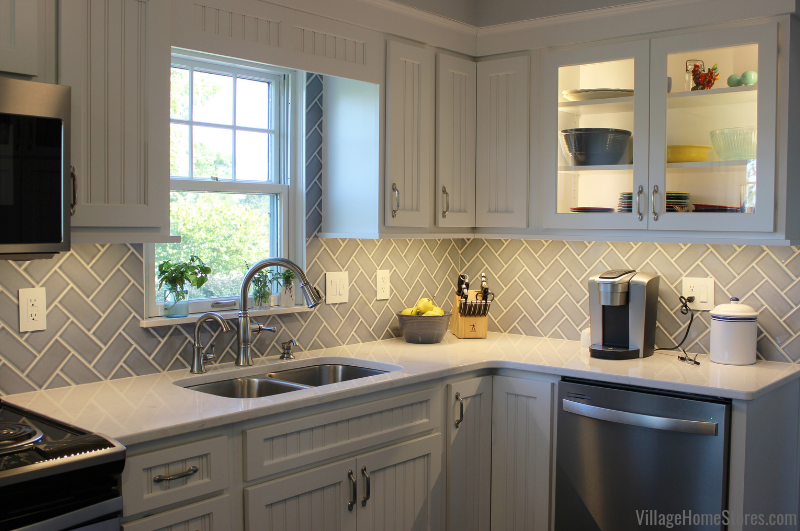 A farmhouse sink sits beneath three windows on one wall of the kitchen design. These three black windows add style and visual rhythm to the space. 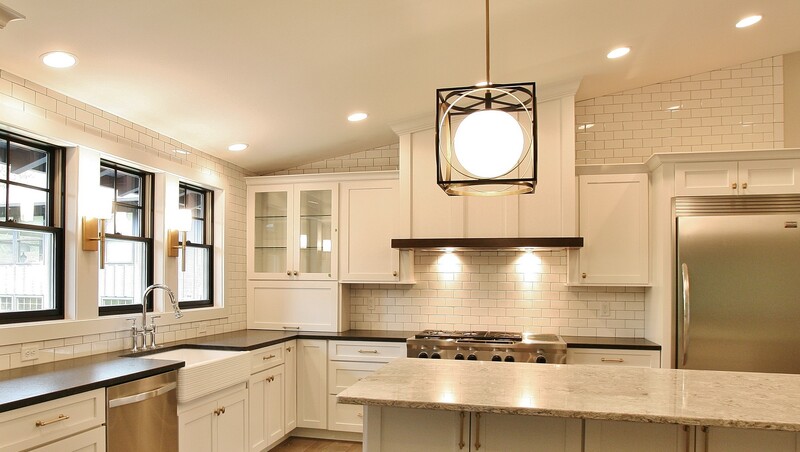 The two “Wadsworth” pendants that hang above the kitchen island are from our Hudson Valley line. 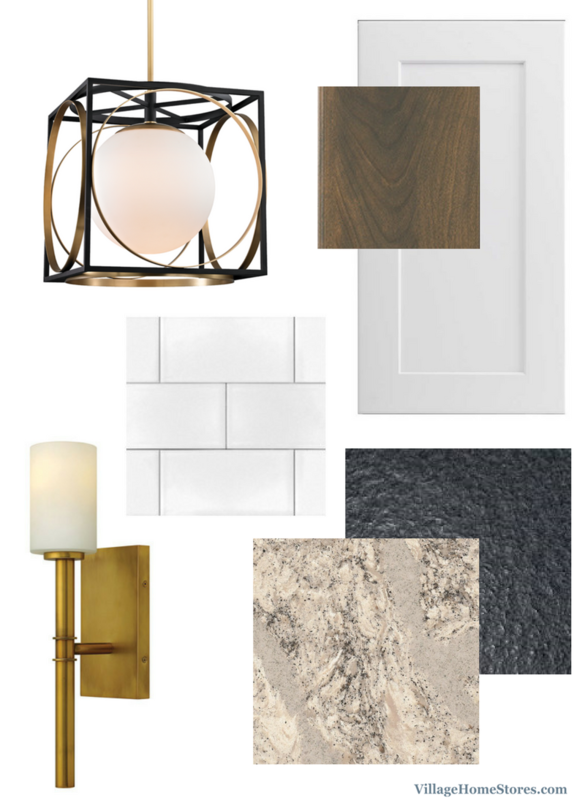 Selecting the perfect lighting for your overall look is so important. 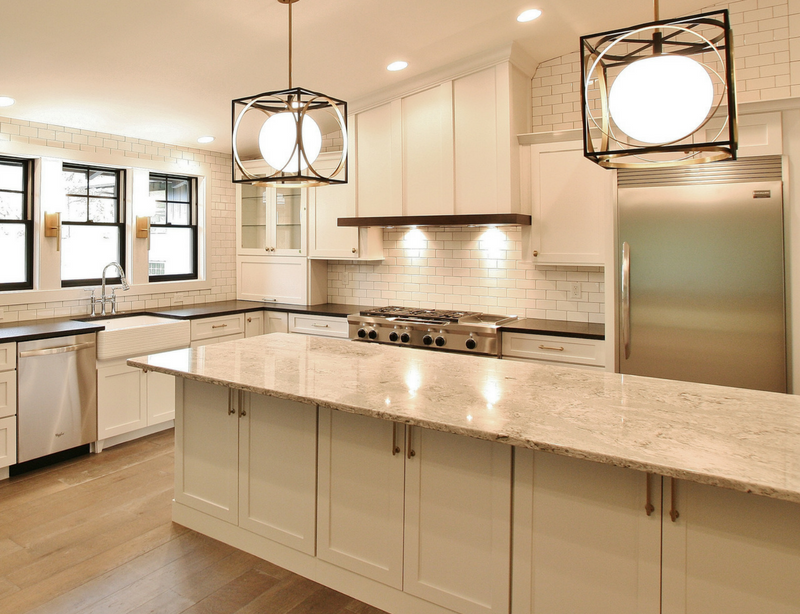 The kitchen island pendants in this home are the perfect example of what we mean. 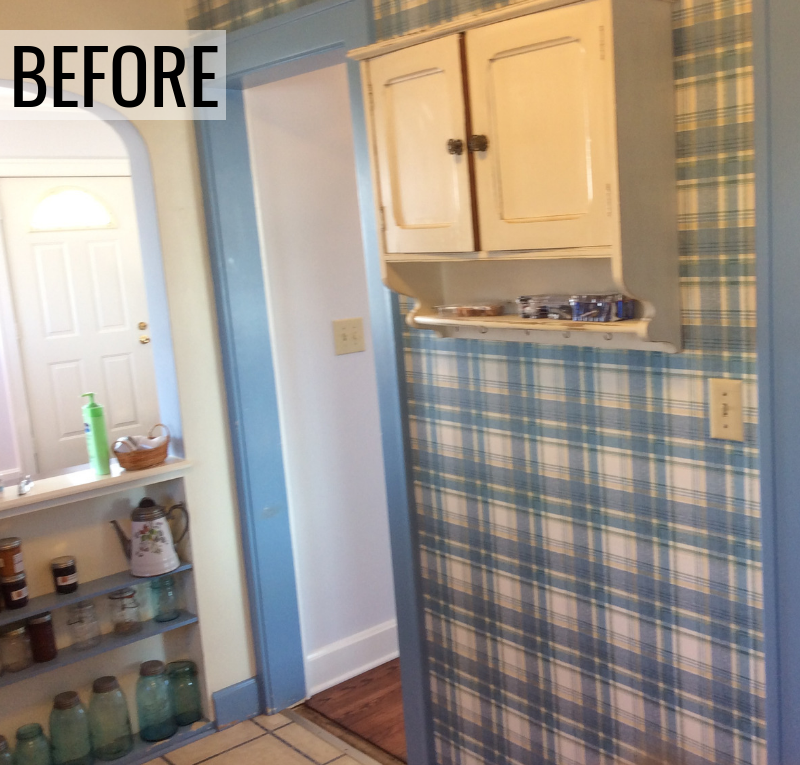 That quote from the homeowner says it all! They truly do complete the entire design. The black accent, the shape, the brass, the circle element (see the barn door below), it is all perfection! 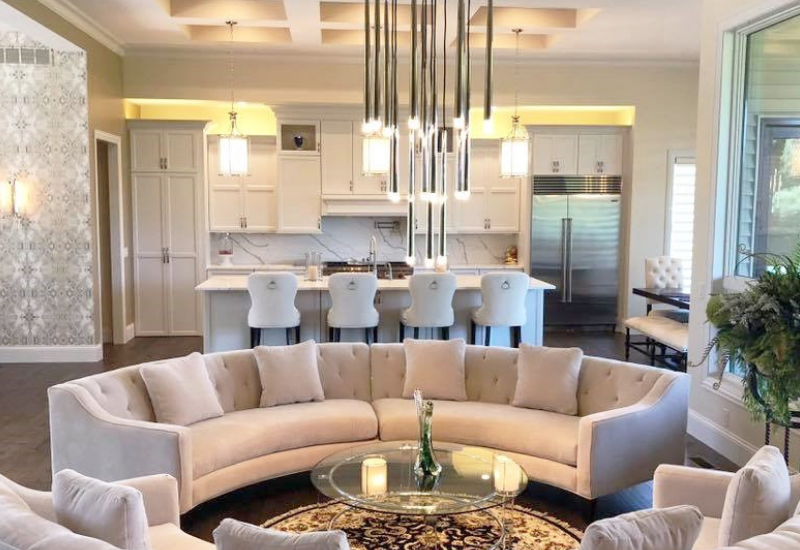 A pendant like that in a catalog or our showroom may seem like a bold statement but our lighting team works hard with our clients to select fixtures perfect for their space. A statement may seem a bit out of your comfort level at the time but the impact will be great! Between the windows hang “Margeaux” wall sconces from our Hinkley line. 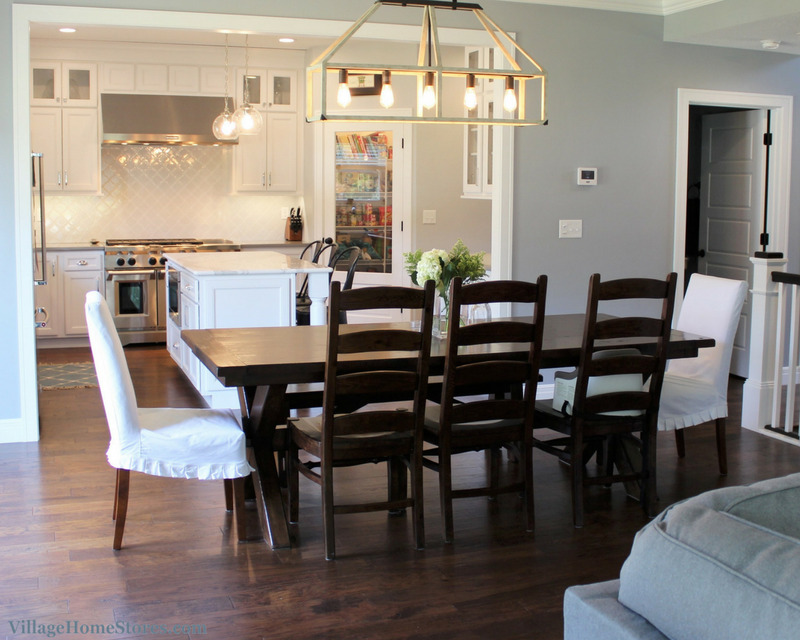 The “Vintage Brass” finish on the sconces is repeated in the kitchen cabinet hardware and accents on the island pendant lights. You do not have to go “all in” on this Gold Accent trend. Just introducing a few locations for it is great! New Traditional style is all about balancing old looks with new materials. In some cases New Traditional blends old finishes with new shapes and styles. 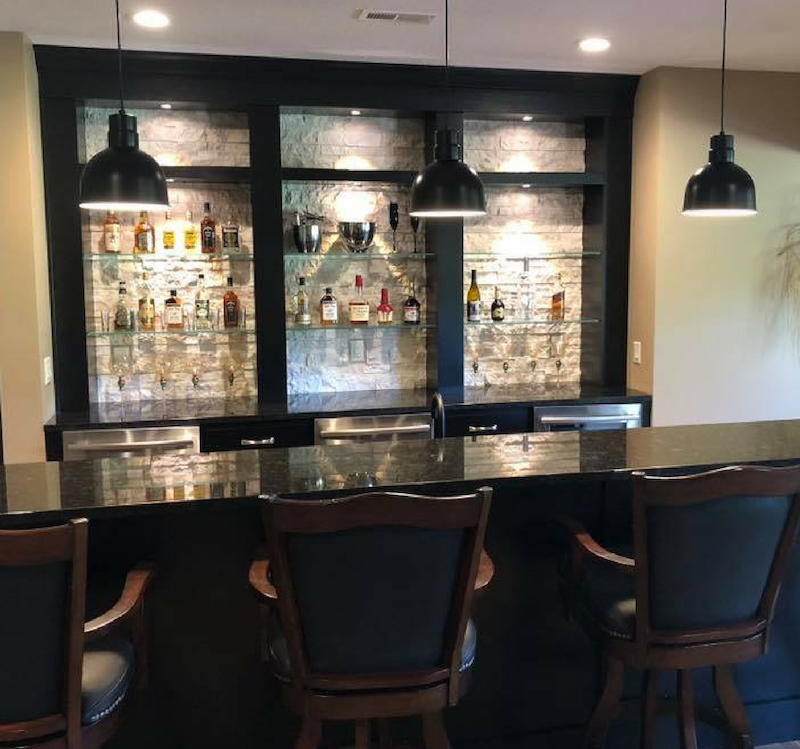 Mixing metal finishes can look great when executed correctly and our team is here to help you find the perfect balance. A great way to make a space more welcoming and less “cold” is to use softer, more matte finishes. 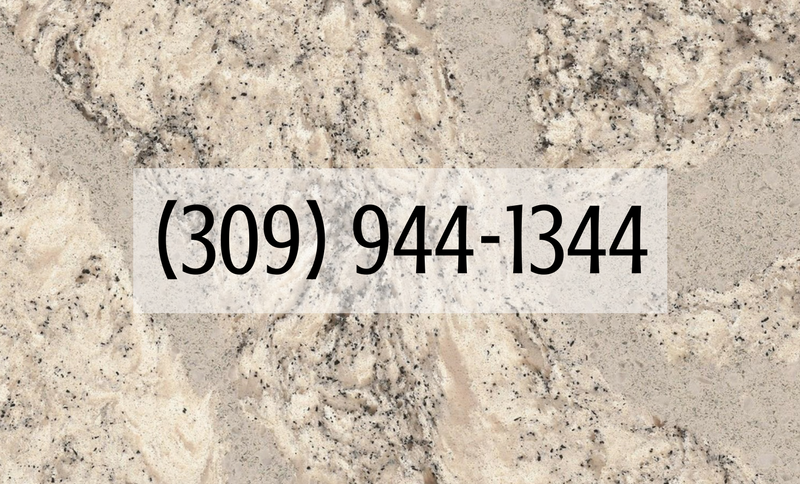 Even a cold, hard material like granite can seem more approachable. 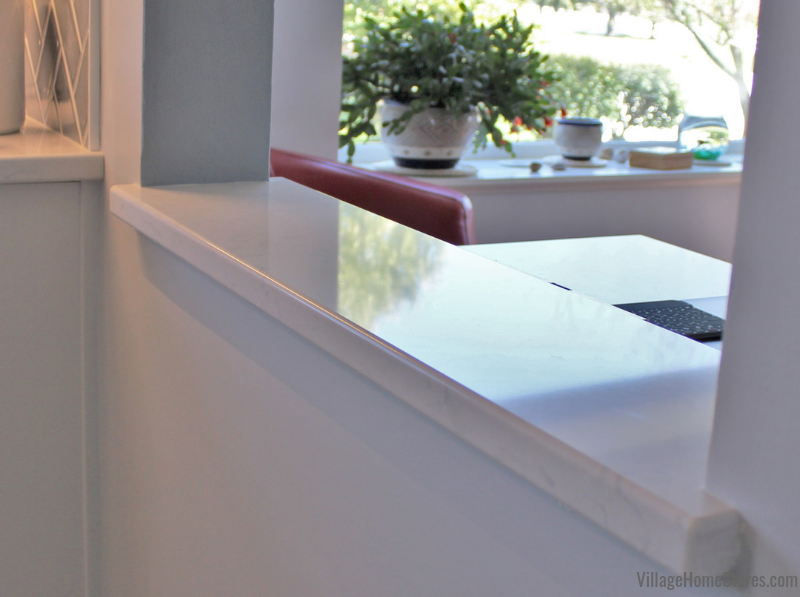 In this case, a Granite named “Black Pearl” has been installed as the perimeter countertop material. Instead of a high-polished and reflective finish, the “Brushed” finish is used. The result: and Old World look almost like that of a soapstone countertop. 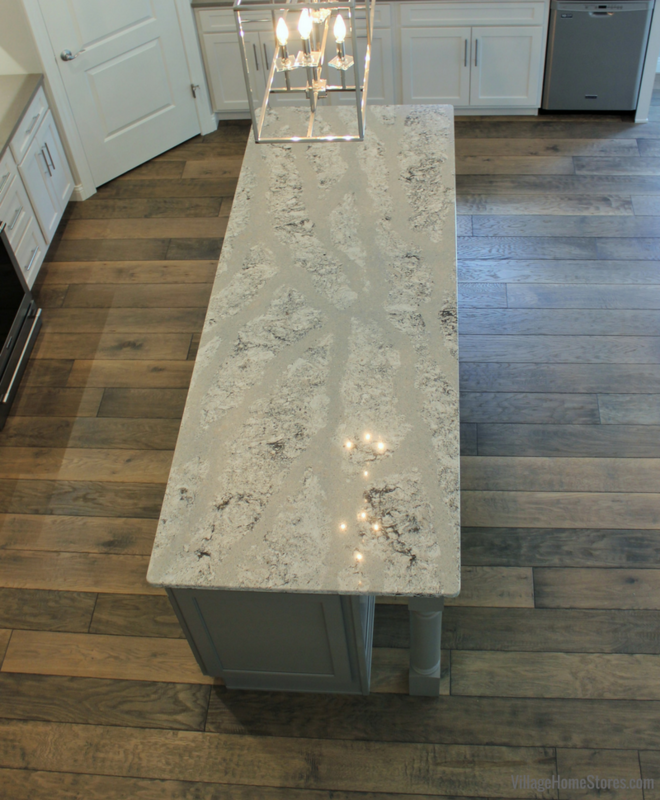 The island countertop is from our Cambria Quartz line in their “Summerhill” design. 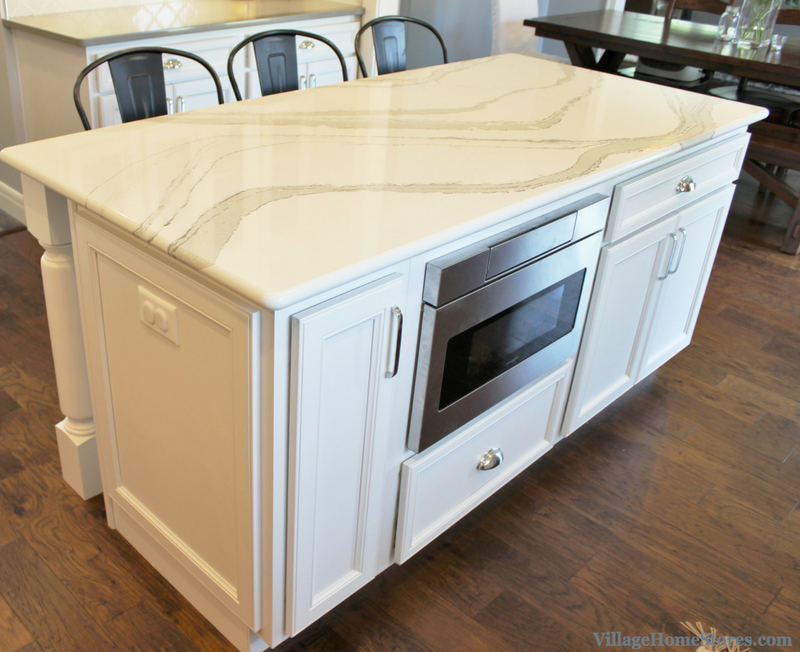 Summerhill blends all of the surrounding colors together perfectly and offers up a natural stone veining look that adds character to the island. 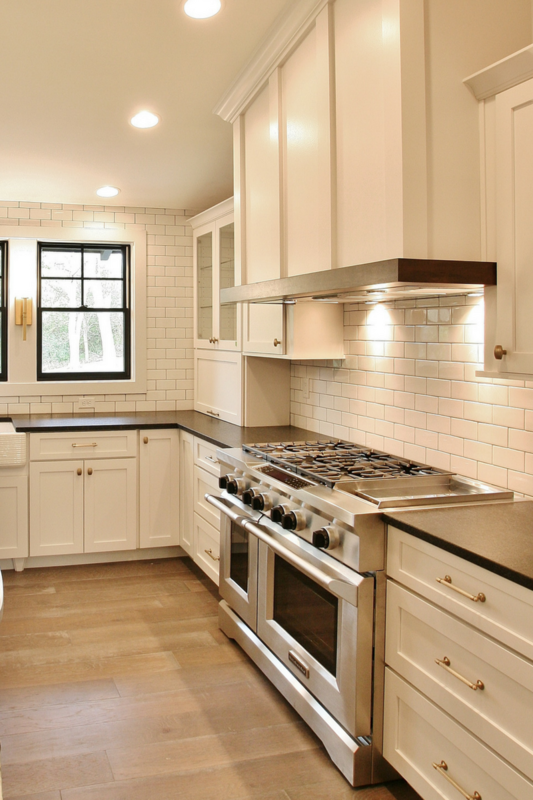 White painted flat-panel cabinetry and subway tile. We are giving you the definite green light for that winning combination! Again, these are classic and timeless selections you can make for your overall permanent investment. 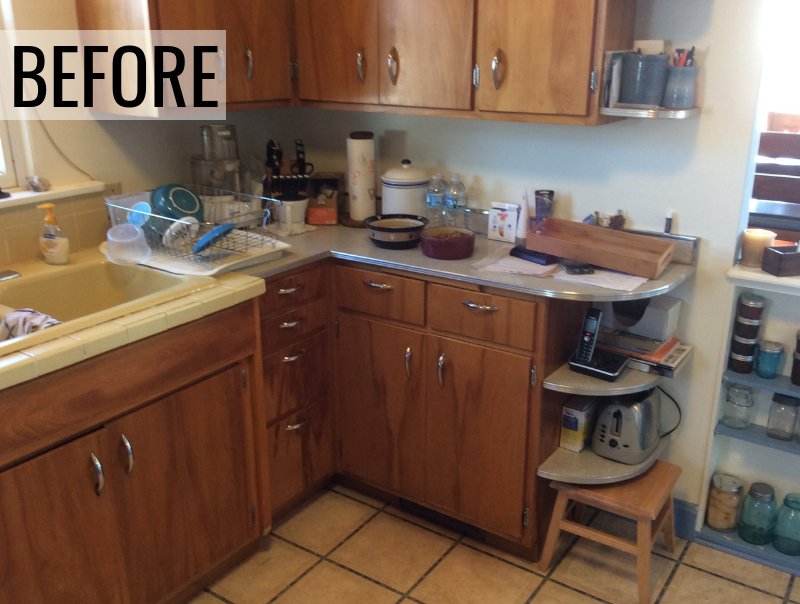 If 15 years from now you wanted to give this kitchen a new look, the entire kitchen may not need to come out to get that “new” update. 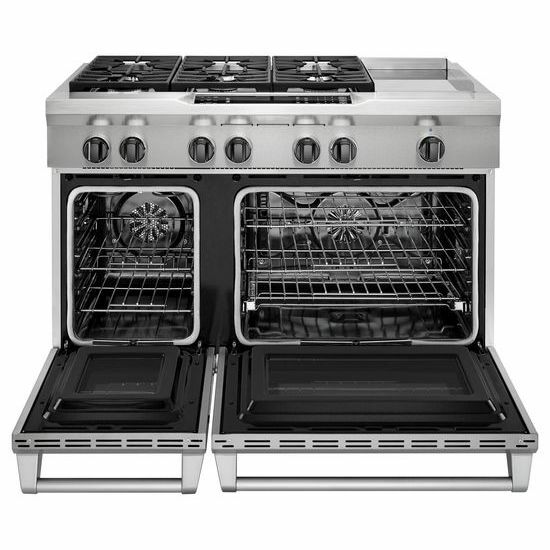 This KitchenAid® Dual Fuel, commercial-style range has 6 gas burners and a chrome electric griddle. The griddle provides exceptional cooking performance and features an easy-to-clean surface. Why Dual Fuel? This range combines the precise control of a gas cooking surface with an electric oven. In the culinary world even the most demanding of cooks can agree that dual fuel is the “best of both worlds” situation for a range. 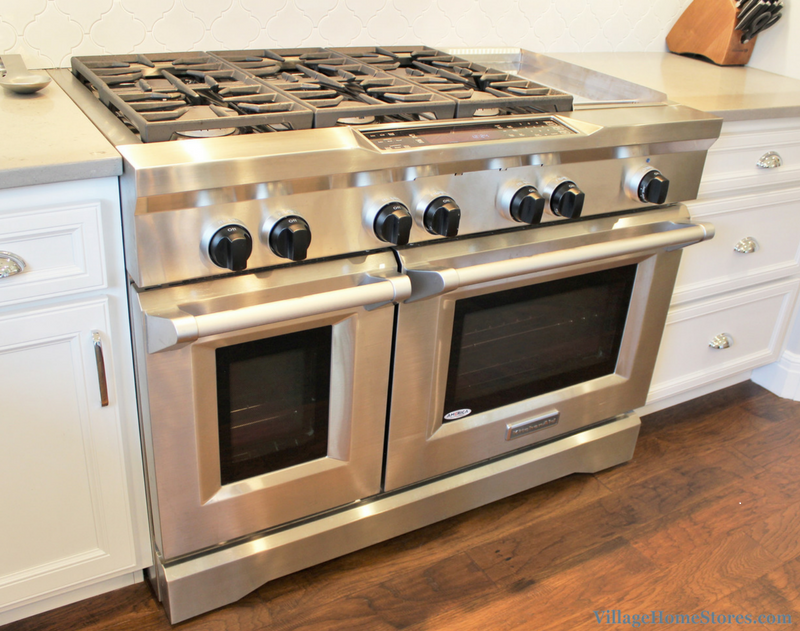 Immediate control for the cooktop and consistent baking, roasting, and broiling in the oven. EvenHeat™ True Convection in the ovens provide consistent heating and even cooking on all racks. Convection helps ensure no burnt edges or undercooked centers and with EasyConvect™ Conversion, it is so easy to use these features. This range combines two ovens for a total of 6.3 cu. ft. of capacity. Shop appliances here or visit our store for an award-winning customer experience and a Low Price Guarantee on home appliances! Gray stains aren’t just still “in style”, they are growing and growing in popularity! 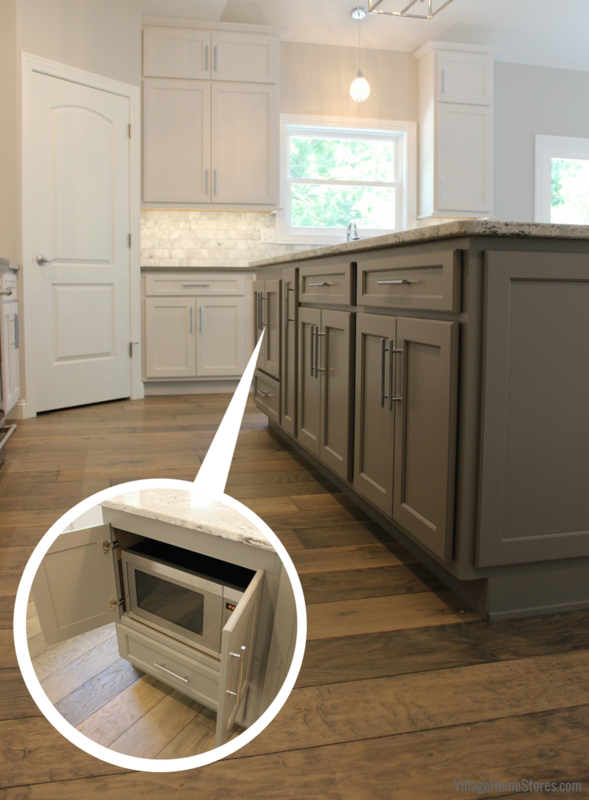 Each of our cabinet lines have invested in continuing to add gray stains to their finish options. Grays have started to trend toward the warmer look. 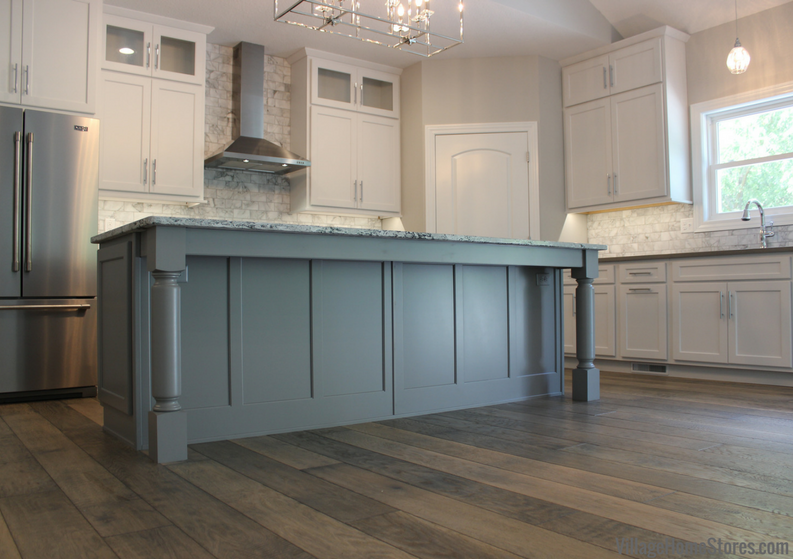 Warm grays blend well with other wood finishes and paints. In this kitchen a tall pantry cabinet with drawers is finished in a contrasting gray stain named “Stone”. 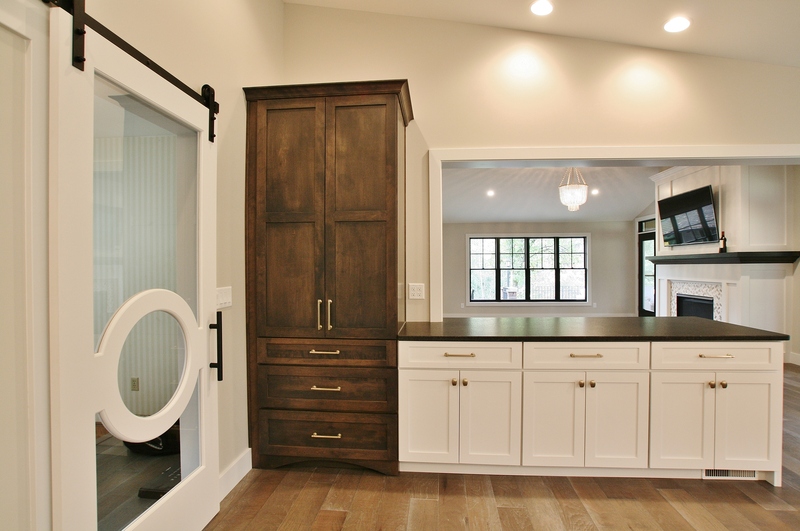 The same Savannah Doorstyle used in the main kitchen is a Cherry wood on the pantry cabinet. Cherry offers a warm and rich woodgrain for the “Stone” stain. We love the use of a contrasting cabinet finish in an unexpected application. We have come to expect the kitchen island, or perhaps a hood to have a contrast finish. Here the location gives the tall cabinet almost the look of a freestanding furniture piece. 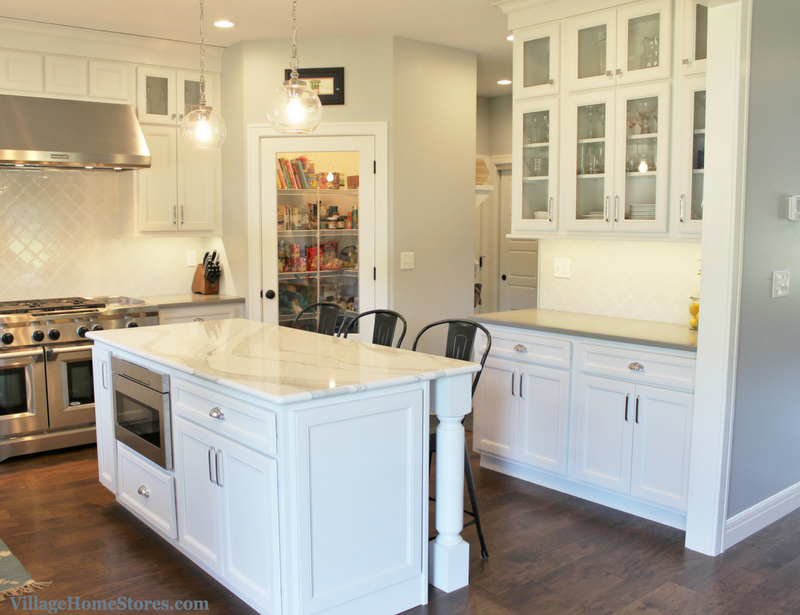 This layout also provides the illusion of two kitchen islands. 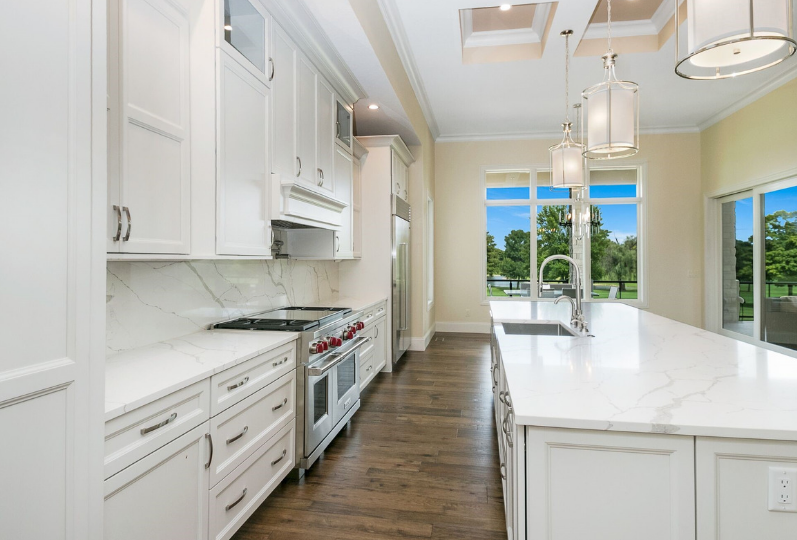 A peninsula runs parallel to the kitchen island. It is always exciting to work with Aspen Homes on a project because they come to us with so many great ideas and enthusiastic clients. Looking to build a new home or remodel the one your are in? 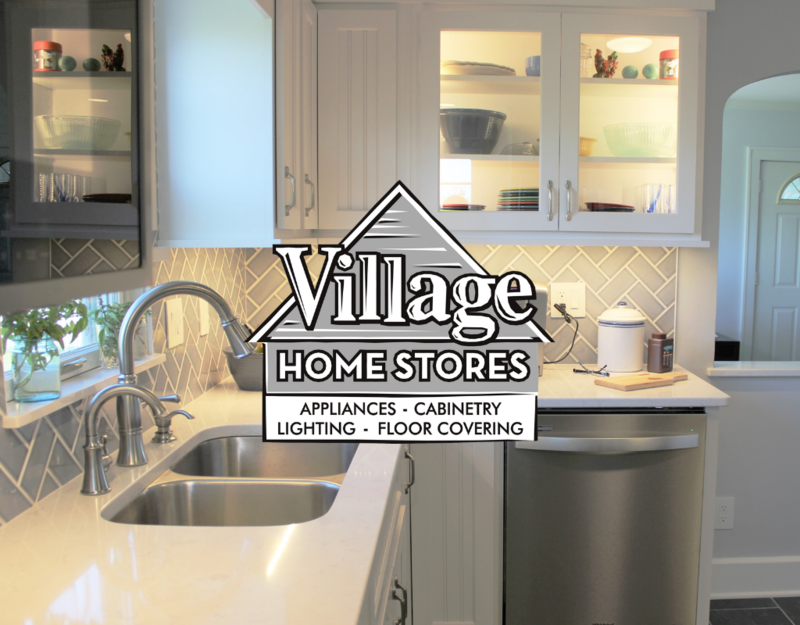 Village Home Stores is your expert Kitchen and Bath destination. We build a team specific to your project’s needs and help make the process as easy and as fun as possible for you. You can find out more information on what you can expect when working with Aspen Homes and Village Home Stores here on a previous post. We are thrilled to welcome Aspen to Instagram in 2017! Give their page a follow to see the beautiful spaces they are working on in the Quad Cities Region. While you are there, find the Village Home Stores Instagram page as well. We love sharing beautiful spaces and behind-the-scenes coverage of what our store is working on day to day. Ready to start the conversation about your own project? Your first step is to reach out to our team. We can’t wait to hear what you are working on!